Waitaha were the first people of Te Waipounamu, journeying here aboard the Uruao waka. They were followed by the migrations of Ngāti Māmoe and finally Ngāi Tahu. By the mid-18th century, through warfare, intermarriage, and political alliances, a common allegiance was formed. 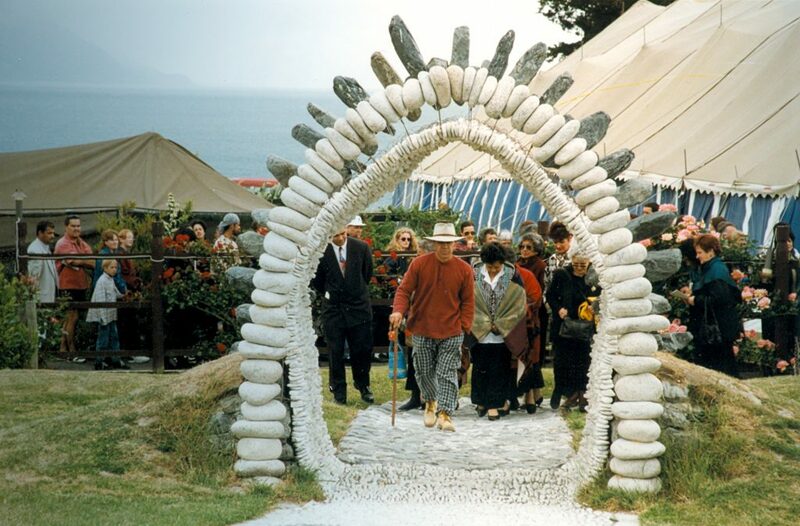 The traditions and histories of Waitaha, Māmoe, and Tahu were woven into a single world view, uniting Ngāi Tahu as mana whenua, the tribal authority, from Te Parinui o Whiti across to Kahurangi Point on Te Tai o Poutini. Ngāi Tahu had its first contact with European sealers and whalers from around 1795. By the 1830s, Ngāi Tahu had built up a thriving industry supplying whaling ships with provisions such as pigs, potatoes, and wheat. In 1835 whaling and sealing stations began to be established onshore under the authority of local Ngāi Tahu chiefs. 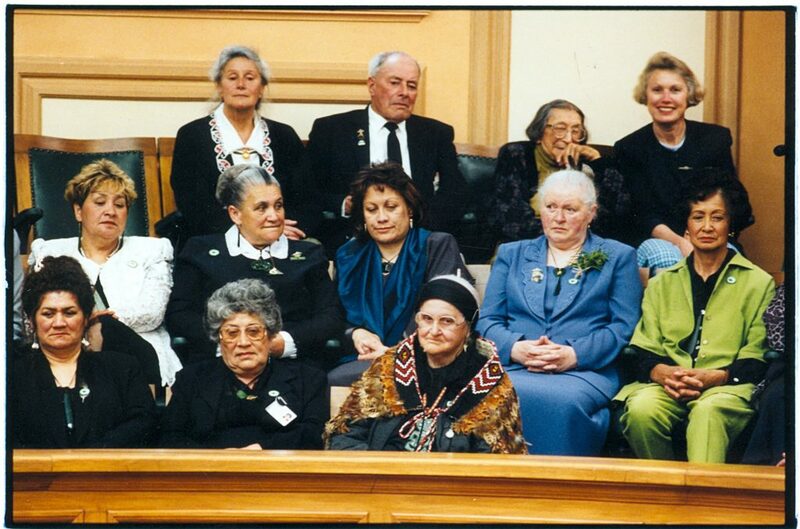 Many Ngāi Tahu women married whalers, and by the time the Treaty of Waitangi was signed in 1840, Ngāi Tahu was no stranger to European ways. 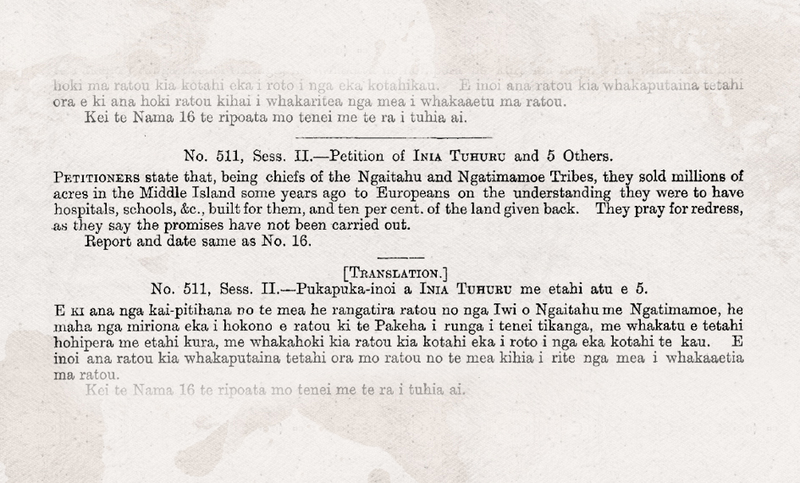 Ngāi Tahu rangatira signed the Treaty at Ōnuku, Ōtākou, and Ruapuke Island. At the time, it was seen as a convenient arrangement between equals. 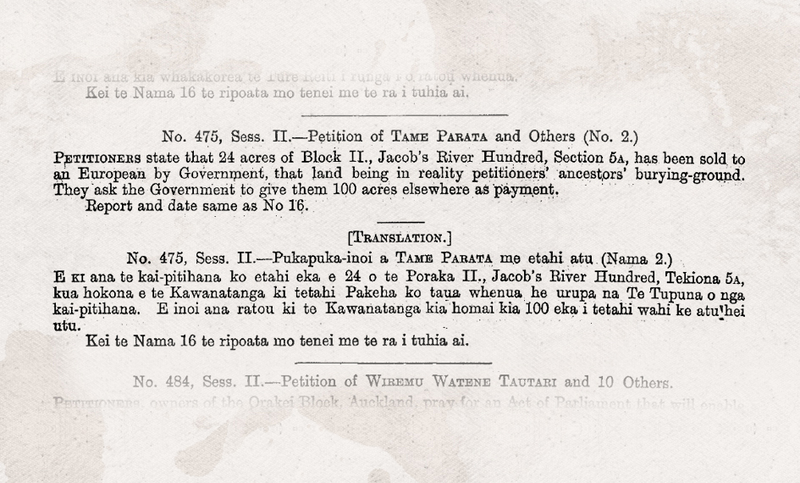 Between 1844 and 1864, in a series of ten land purchases, the majority of Te Waipounamu was purchased by the Crown from Ngāi Tahu. The largest was the 1848 Canterbury Purchase, commonly known as Kemp’s Deed. 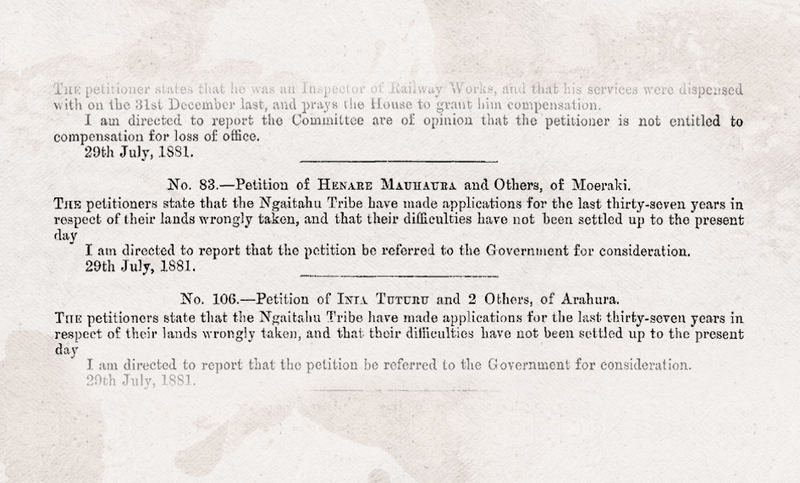 However, the Crown then failed to honour their obligations under these land purchase agreements. 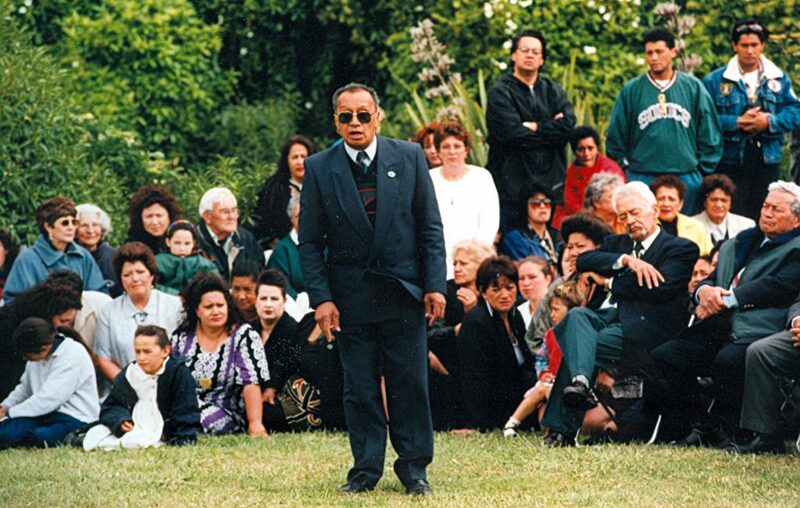 Over the ensuing years the tribal authority of Ngāi Tahu was diminished, people were ostracised from their land, connections were fragmented, and language and knowledge suppressed. 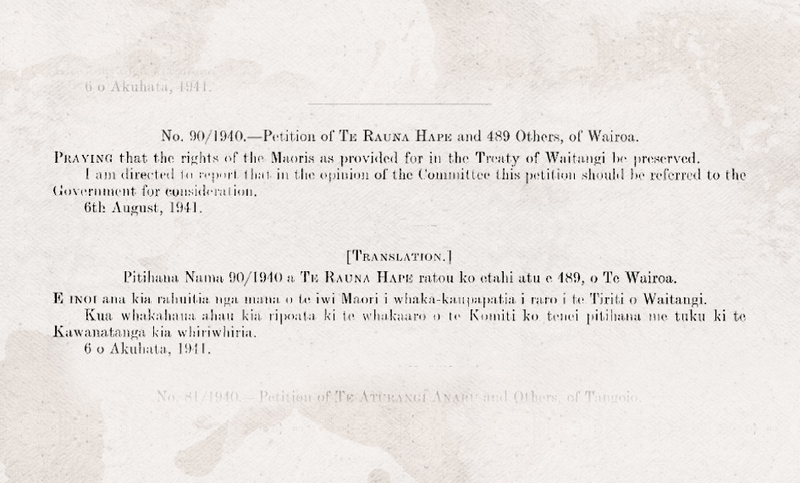 For 150 years Ngāi Tahu fought tirelessly to gather evidence of Crown wrongdoings, and by the time Te Kerēme — the Ngāi Tahu Claim — was lodged with the Waitangi Tribunal in 1986, its legitimacy had already been established through an extensive series of commissions, inquiries, courts, and tribunals. 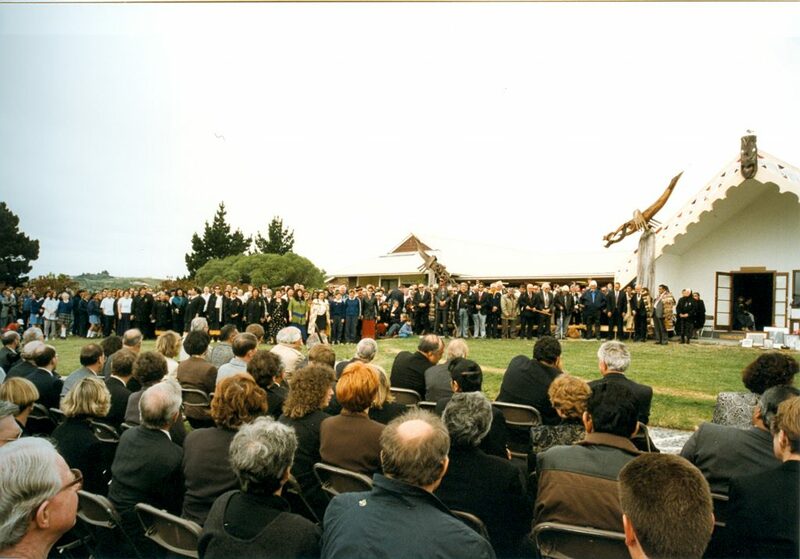 In 1997 the Ngāi Tahu Deed of Settlement was signed at Takahanga Marae, Kaikōura, and the following year the Ngāi Tahu Claims Settlement Act was passed. Ngāi Tahu received a Formal Apology from the Crown, the return of its ancestral maunga Aoraki, and a Cultural Redress Package that consisted of new statutory mechanisms to express the traditional kaitiaki relationship with the environment. 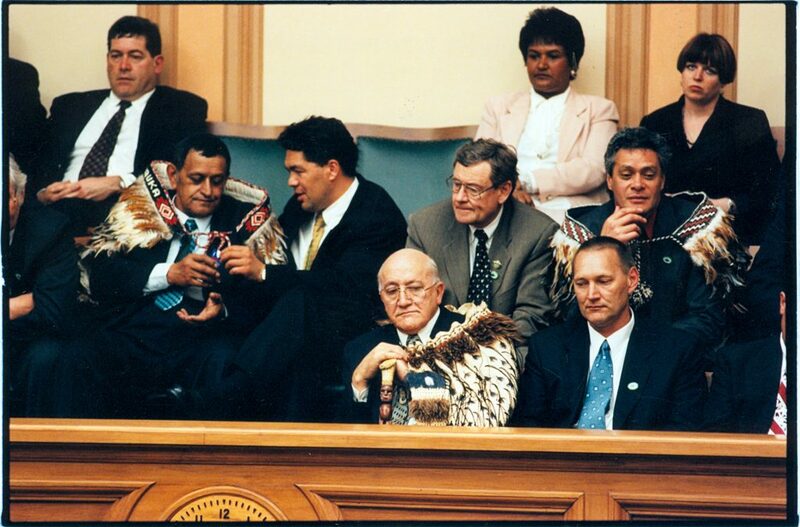 The Economic Redress Package of the Ngāi Tahu Settlement consisted of $170 million cash, as well as specific mechanisms to provide Ngāi Tahu with the capacity, right, and opportunity to re-establish its tribal base. 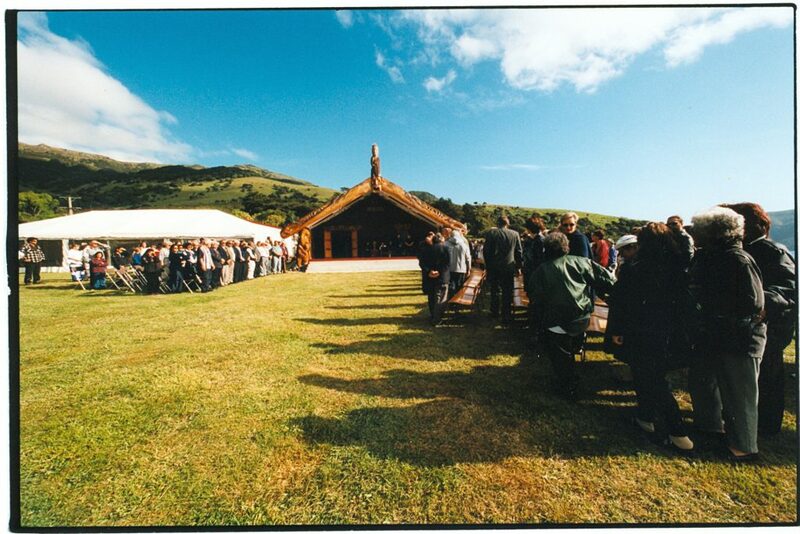 This year, 2017, we are celebrating 20 years since the signing of the Deed of Settlement at Takahanga Marae. 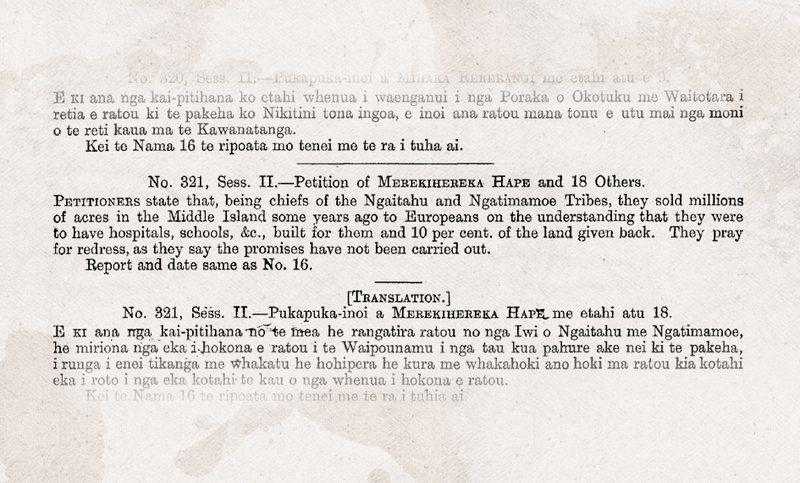 To mark this occasion, we have created the resources below to help whānau look back through the significant events that took place in the 150 years leading up to the culmination of the signing of the Ngāi Tahu Deed of Settlement. 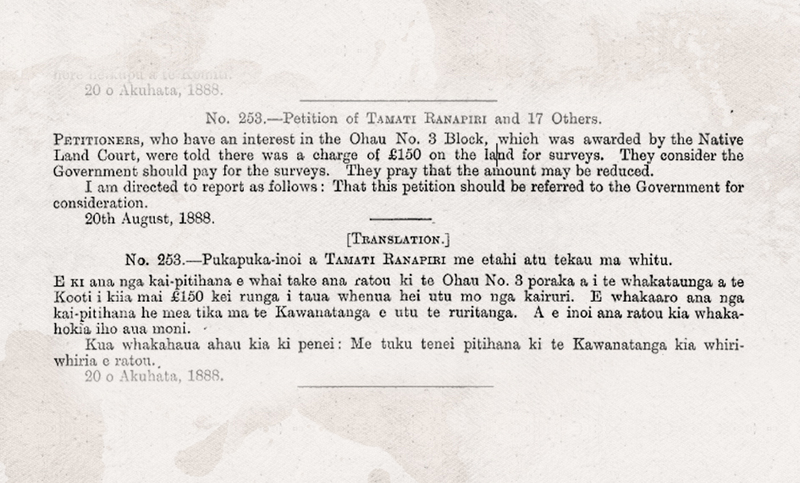 In 1844 Ngāi Tahu sold over 400,000 acres of land in the Otago region to the New Zealand Company for £2,400. In contrast to many of the later purchase agreements, great care was taken to establish the boundaries of the area to be sold and to identify the land which was specifically reserved from the sale. The land retained by Ngāi Tahu was around 9,615 acres and represented some (but not all) of those areas which Ngāi Tahu did not wish to relinquish. However, the Ngāi Tahu understanding of the agreement was that further reserves would be set aside, amounting to one-tenth of the total area sold. This was never done. Kemp’s Deed was the 1848 sale of a vast land area comprising most of Canterbury, Westland and Otago, and was by far the largest land purchase made by the Crown. Henry Tacy Kemp, acting on behalf of the Crown, purchased 13,551,400 acres of land for £2,000. The boundaries were not well defined at the time and the exact area purchased by the Crown has always been a contentious issue for Ngāi Tahu. In any event, it is important to note that out of that massive acreage, the area set aside by the Crown for Ngāi Tahu was a meagre 6,359 acres. The previous year the Crown had ‘purchased’ a large area of Ngāi Tahu land from Ngāti Toa under the Wairau Deed. 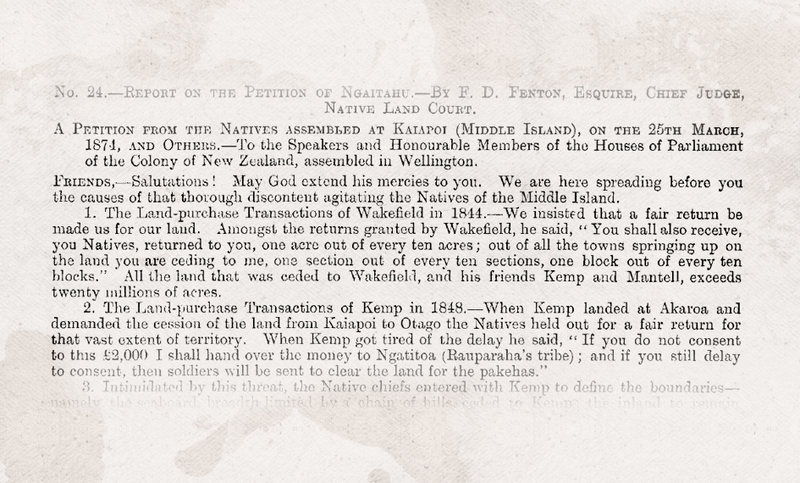 As a consequence of that action Ngāi Tahu felt compelled to sign Kemp’s Deed in order to confirm their mana over the remaining land. The Banks Peninsula claims consisted of three ‘purchases’ by the Crown (Port Cooper 1849, Port Levy 1849, and Akaroa 1856). The background against which these three Deeds were signed is complicated. 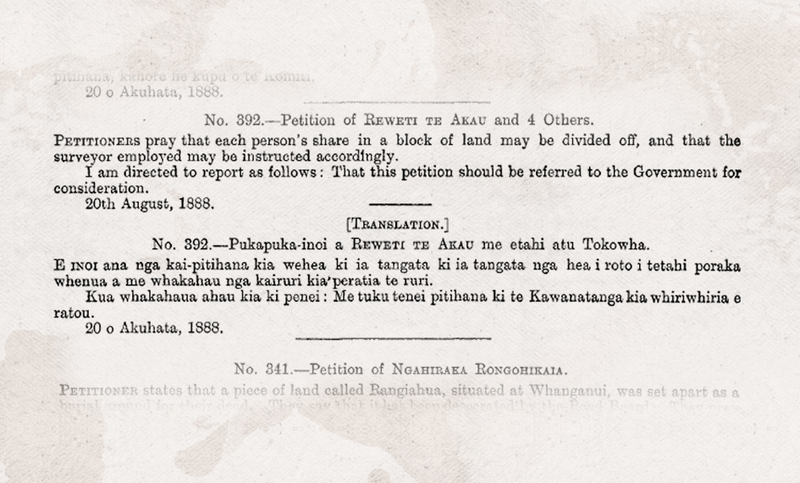 The French claimed to have purchased the land from Ngāi Tahu by way of two deeds of sale in 1838 and 1840. 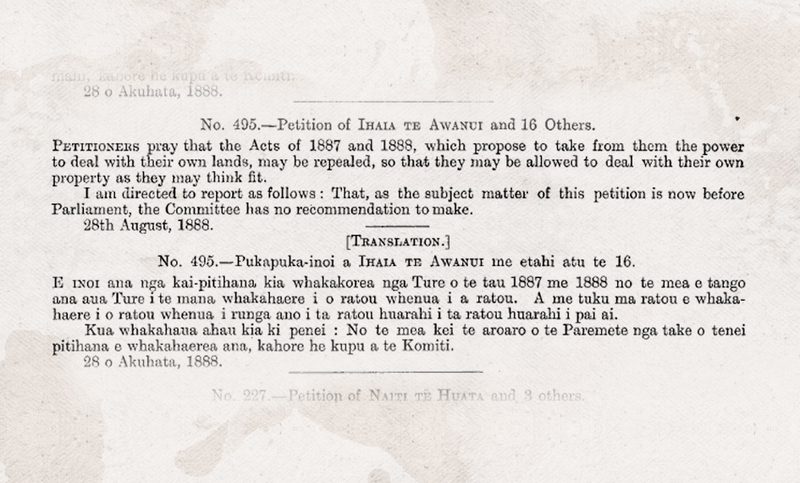 At the same time the Crown was asserting that not only were the French Deeds invalid, but that the land Ngāi Tahu claimed to own had already been sold to the Crown under Kemp’s Deed. 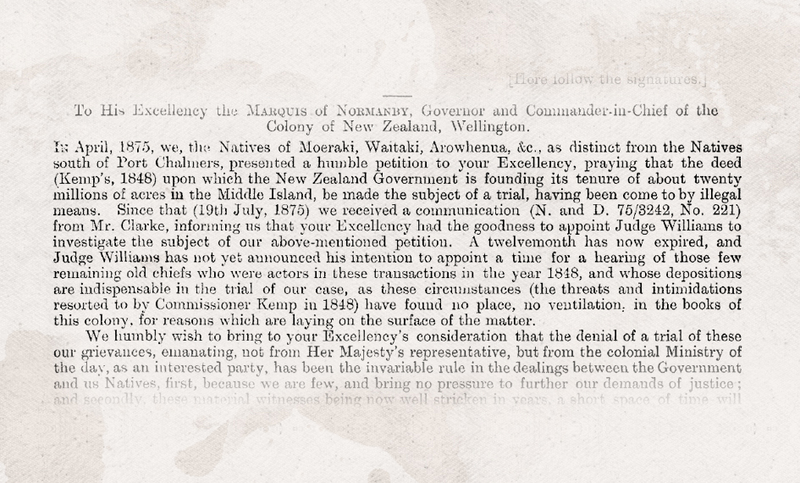 When it became apparent that Ngāi Tahu did not accept that either the French or the Crown had secured the title to Banks Peninsula, Governor Grey sent Walter Mantell to settle the matter. In short, Mantell was to secure the Crown title to the land and to dispose of any Ngāi Tahu interest in the land as expediently as possible. Thus from the Crown perspective, the Banks Peninsula transactions were not to be treated as purchases, but were more in the nature of granting awards of reserves and cash in return for any residual claims Ngāi Tahu may have had on the Crown title. 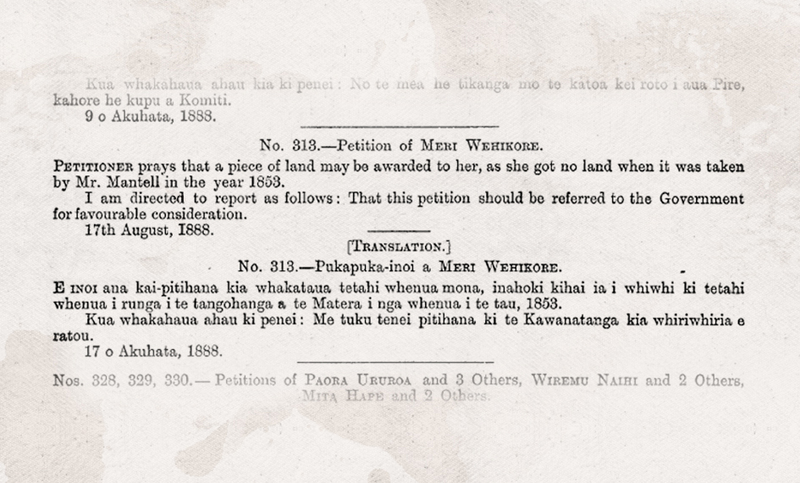 Mantell was given a clear directive to disregard any claims Ngāi Tahu might make with regard to their ownership of the land. 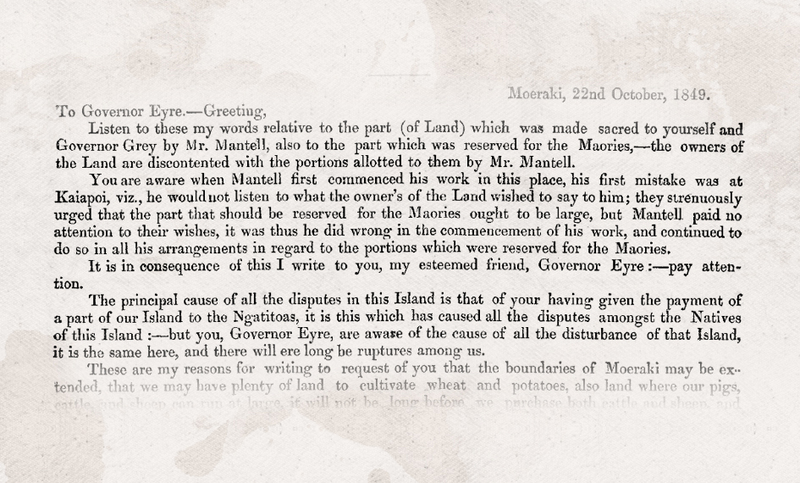 The discussions between Mantell and Ngāi Tahu were difficult and protracted but eventually Ngāi Tahu were persuaded to sign the Port Levy and Port Cooper Deeds. 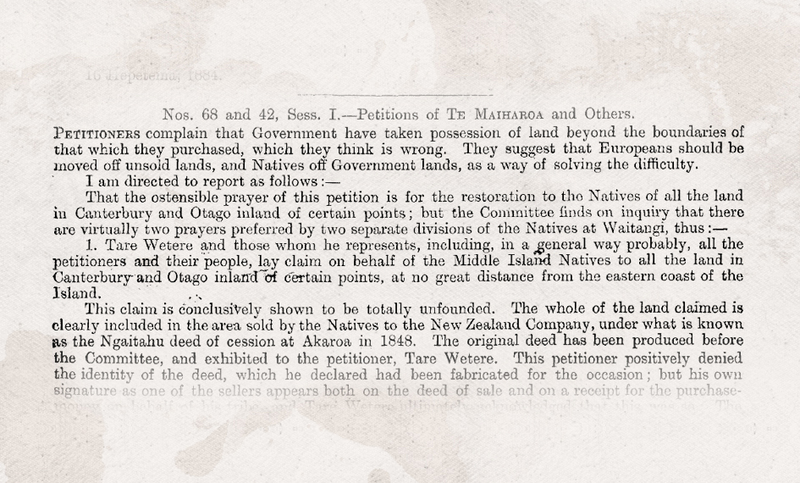 The Waitangi Tribunal upheld the Ngāi Tahu claim that both of those Deeds represented forced sales. 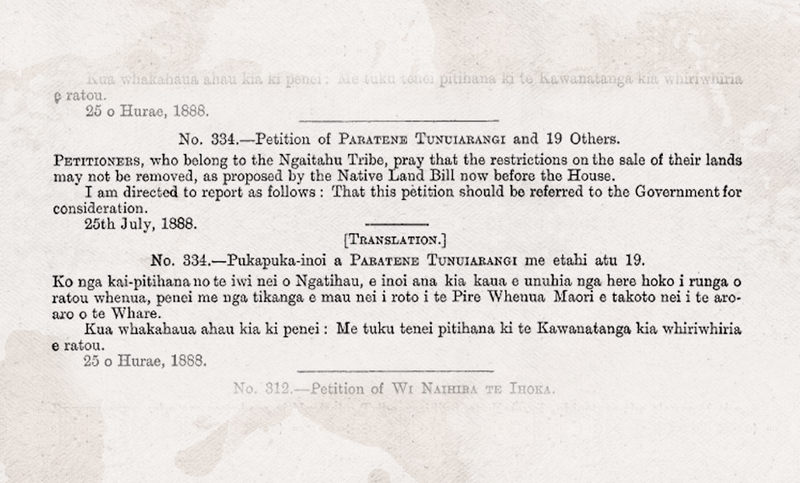 In 1849, Mantell’s meagre offer to extinguish Ngāi Tahu title to Akaroa was firmly rejected. 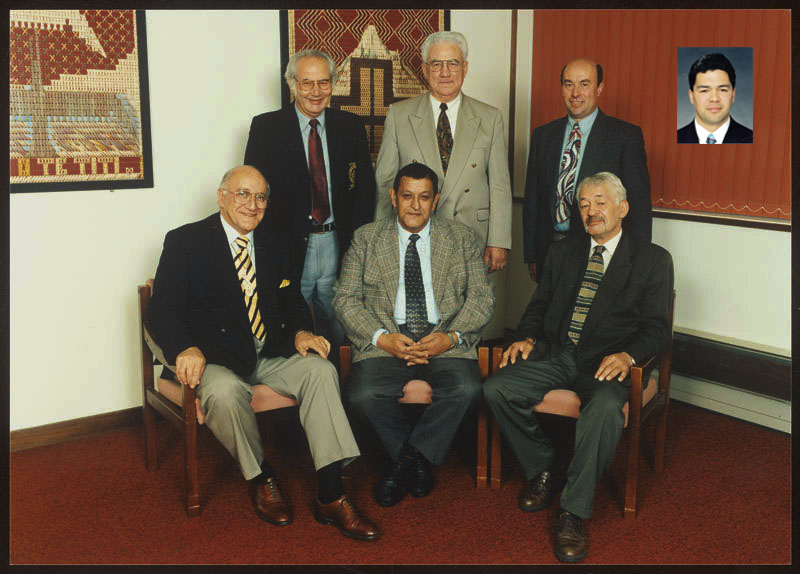 When Mantell refused to set aside about 30,000 acres on the southern end of Banks Peninsula, the assembled Ngāi Tahu chiefs could not be persuaded to sign the Deed. For the next few years Mantell claimed that the Ngāi Tahu title to the land had been extinguished because the offer was made on a ‘take it or leave it basis’. However, by 1856 the Crown was forced to acknowledge that this was not the case. 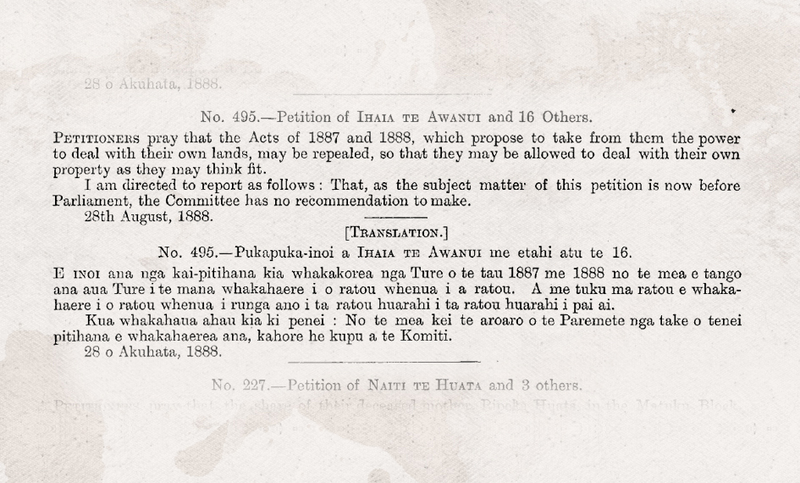 In 1856, after a further round of negotiations Ngāi Tahu signed the Akaroa Deed. 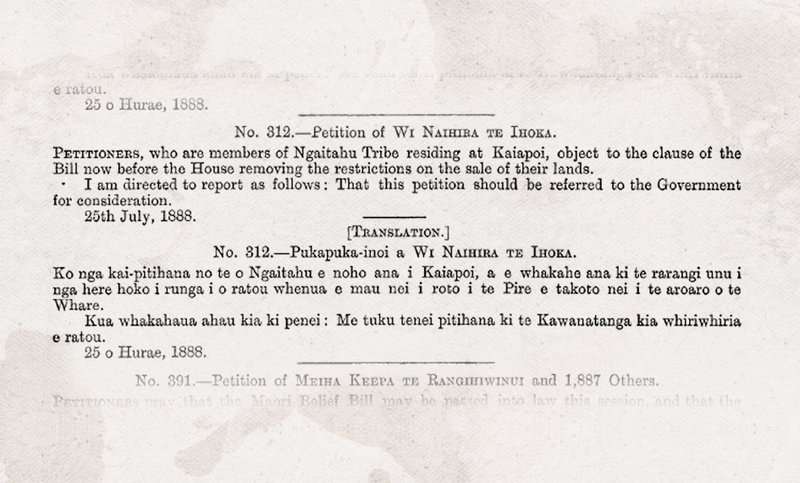 Under these three deeds, Ngāi Tahu was forced to concede title to 251,500 acres in return for £700 and were left with 3,426 acres of reserves. As a result of these acts, most Ngāi Tahu of Banks Peninsula were eventually driven off their land. The Banks Peninsula claims consisted of three ‘purchases’ by the Crown (Port Cooper 1849, Port Levy 1849, and Akaroa 1856). The background against which these three Deeds were signed is complicated. 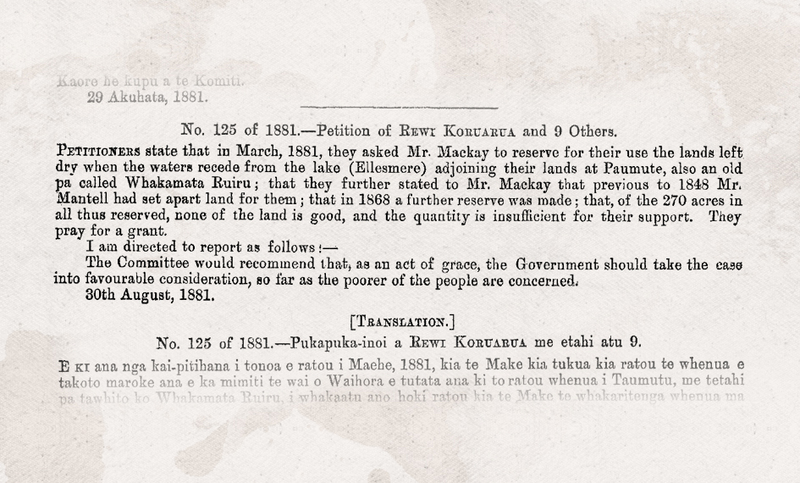 The French claimed to have purchased the land from Ngāi Tahu by way of two deeds of sale in 1838 and 1840. 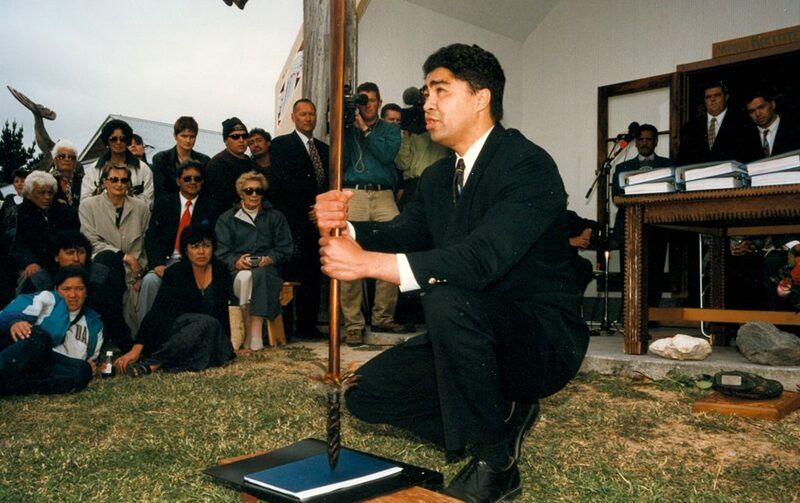 At the same time the Crown was asserting that, not only were the French Deeds invalid, but that the land Ngāi Tahu claimed to own had already been sold to the Crown under Kemp’s Deed. In 1853, Mantell was given the task of acquiring over 7 million acres for £2,600 in the Southland region. As in other purchases he had negotiated, Mantell was given the power to set aside such reserves for Ngāi Tahu as he thought to be proper, taking into account that these reserves should provide for their present and future needs. Mantell ignored many of the Ngāi Tahu requests for reserves and would only agree to set aside 4,875 acres, about 17 acres per person. 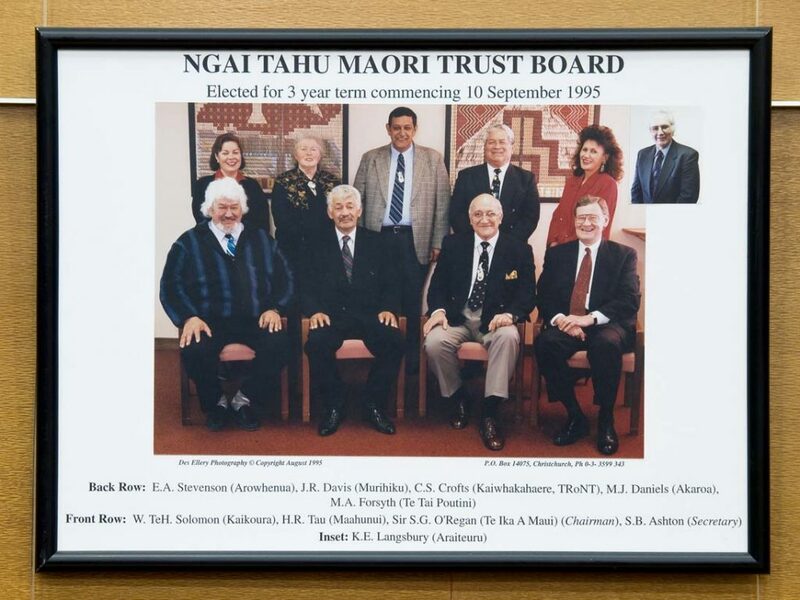 Part of the agreement – and one of the main reasons Murihiku chiefs agreed to Mantell’s offer – was that Ngāi Tahu would be provided with schools and hospitals alongside of each Ngāi Tahu village. This promise was never fulfilled. As was the case in other purchases, the boundaries of the area to be included in the sale were not made sufficiently clear at the time. Ngāi Tahu have always maintained that the region known as Fiordland was not to be included in the Murihiku Purchase. 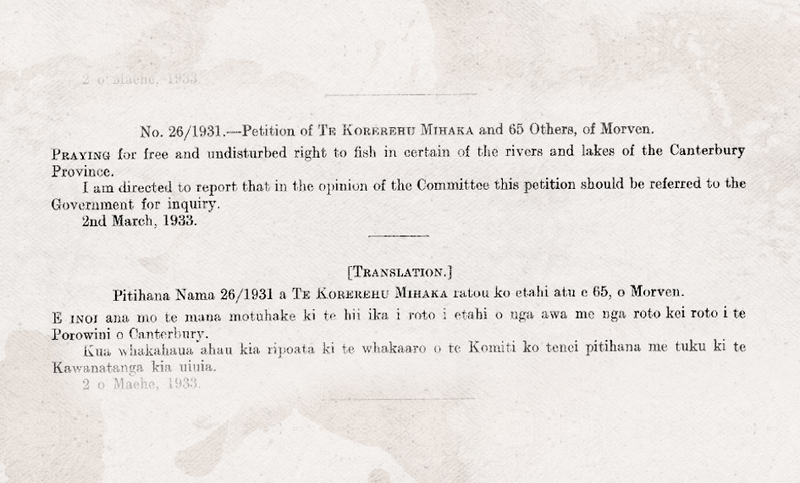 For some years the Crown refused to consider the Ngāi Tahu claim north of Kaiapoi because the Crown had accepted Ngāti Toa’s claim to this area in the Wairau Purchase of 1847. The Crown believed that Europeans could settle in this region without Ngāi Tahu consent. 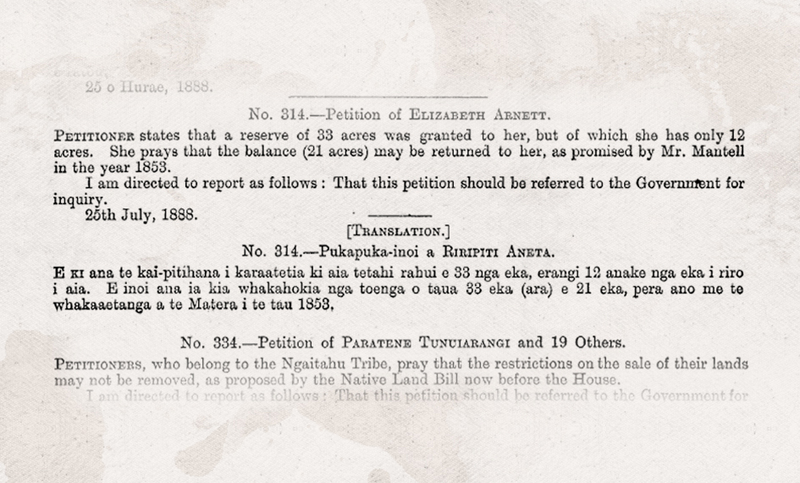 This settlement process was given further momentum when the Canterbury Association Land Settlement Act 1850 was passed. 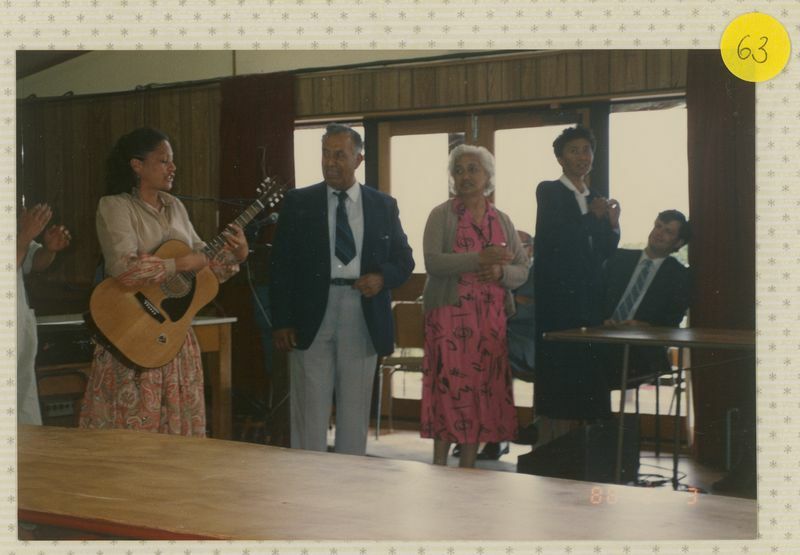 This act empowered the Canterbury Association to sell all the land between the Waipara River and Hakatere (Ashburton River), without any reference to Māori. This included the land in the North Canterbury region which had not yet been purchased from Ngāi Tahu. Ngāi Tahu never relinquished its claim to the area north of Kaiapoi up to Te Parinui o Whiti. 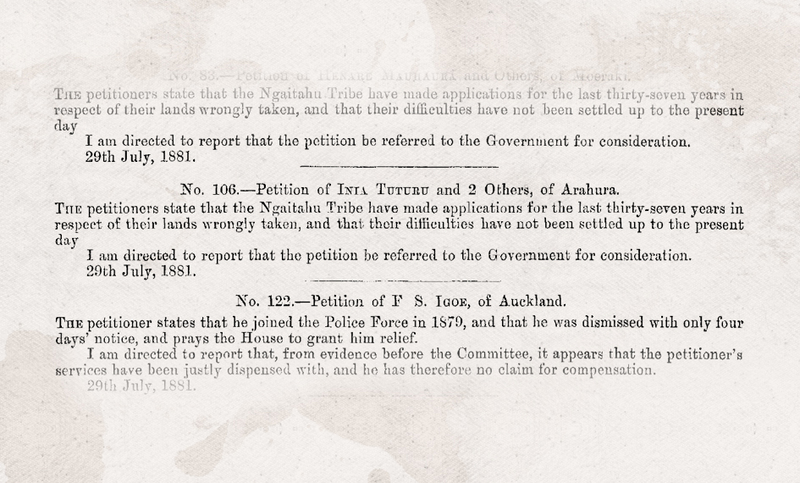 For many years Ngāi Tahu petitioned the Crown to have its mana over this land recognised and in 1856 when Governor Gore Browne visited Canterbury he was persuaded to have the matter investigated. 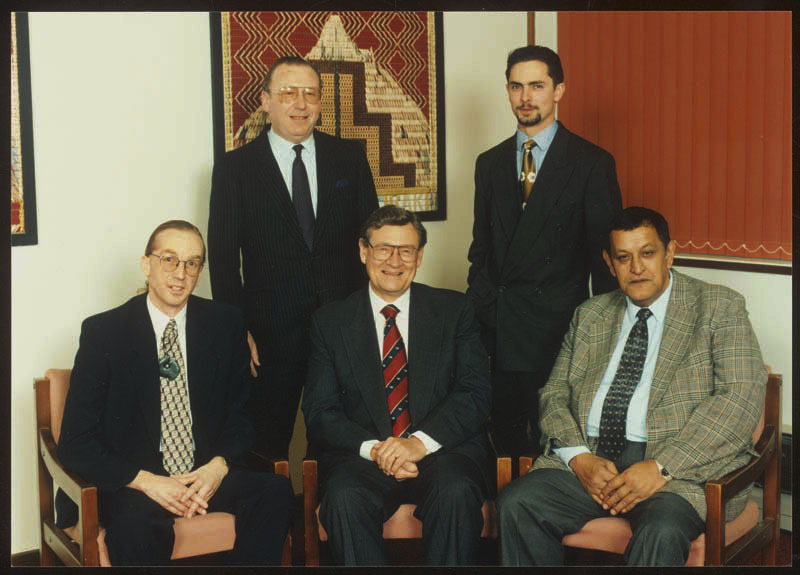 On the advice of Donald McLean (the chief land purchaser for the Crown) the Crown accepted that the area did in fact belong to Ngāi Tahu and not to Ngāti Toa. 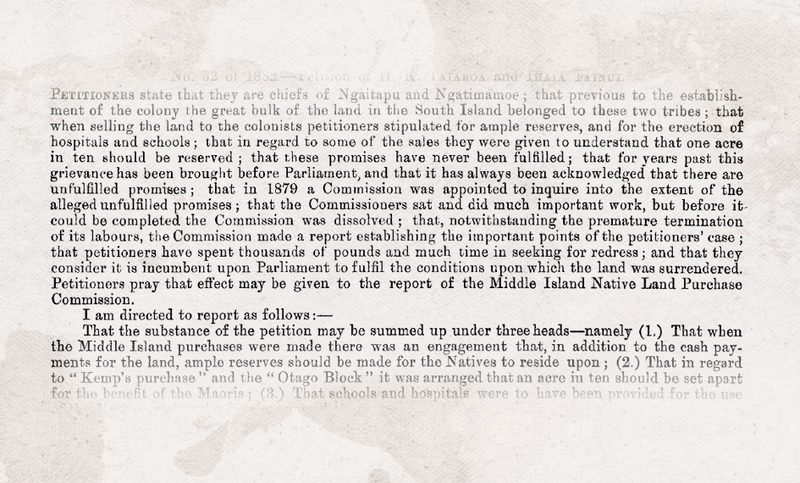 As a consequence, William John Hamilton was given instructions to negotiate the purchase of the North Canterbury block from Ngāi Tahu. In 1857, Hamilton met with Ngāi Tahu and agreed to pay £500 to complete the purchase. Hamilton refused to set any reserves aside, saying his instructions did not permit him to do so. In any event almost all of the land was already in European hands. As with the earlier Banks Peninsula purchase, the ‘negotiations’ were very much a case of ‘take it or leave it’. In this instance the Crown was able to acquire title to over 2,137,500 acres without making any provision for Ngāi Tahu to retain any of its land whatsoever. The background of the Kaikōura Purchase was similar to that of the North Canterbury Purchase. For some time the Crown had believed that it had purchased the land from Ngāti Toa under the Wairau Deed. During that period, the Crown leased almost all of the Kaikōura region to pastoral farmers, meaning that by the time Ngāi Tahu’s right to the area were recognised, there was very little land left which was not already in European hands. 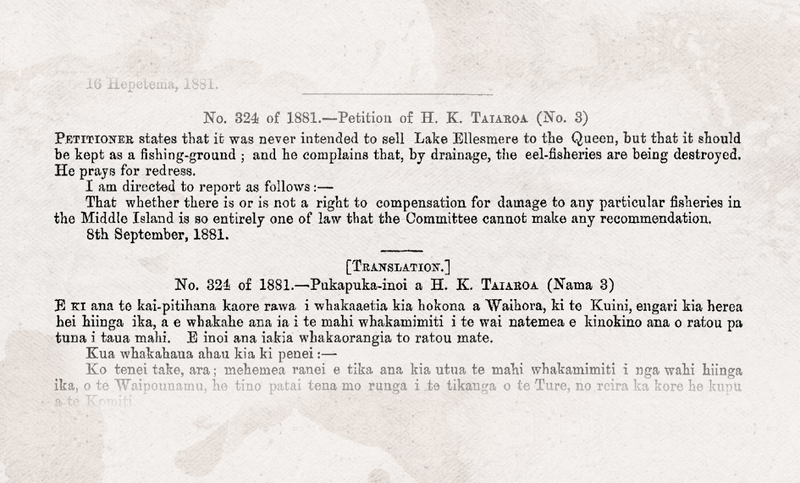 In 1859 the Crown appointed James Mackay Jr to negotiate with Ngāi Tahu to complete the Kaikōura Purchase. Mackay refused to consider the Ngāi Tahu original asking price of £10,000 or to set aside a reserve of about 100,000 acres between the Kahutara and Piri-tūtaeputaputa (Conway) Rivers. 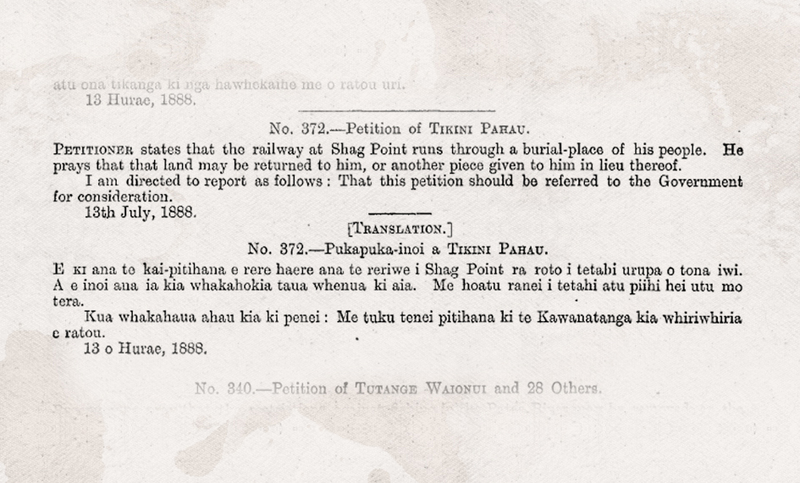 Eventually Ngāi Tahu was persuaded to part with ownership over a large area of land (2,817,000 acres) for the nominal price of £300 and with little say over the size and location of the reserves that were left to the iwi. In this case the area of the reserves was a mere 5,558 acres, most of which was described by Mackay himself as being of the “most useless and worthless description”. 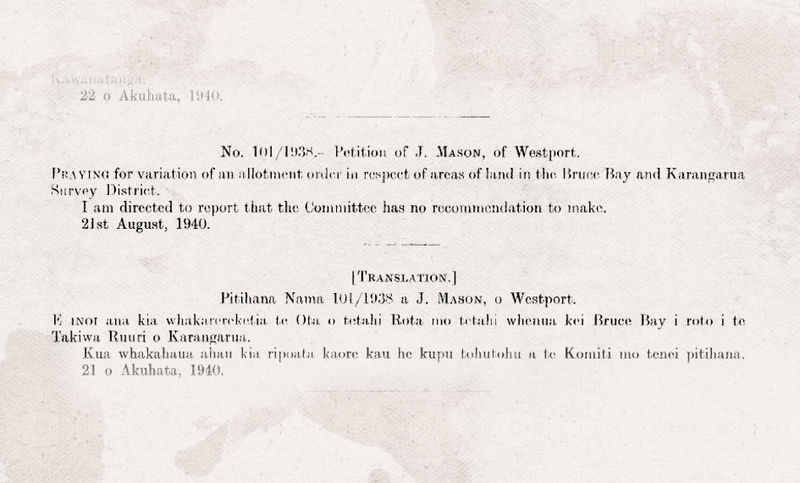 James Mackay Jr was sent to negotiate the purchase of 6,946,000 acres on the West Coast from Ngāi Tahu in 1859. Mackay was under strict instructions to pay no more than £150 to secure this vast area of land. He was also to ensure that the total area of reserves to be set aside did not exceed 500 acres. The Crown was aware that gold had been discovered on the West Coast and was keen to secure the title to the land before Ngāi Tahu realised the value of gold to Europeans. 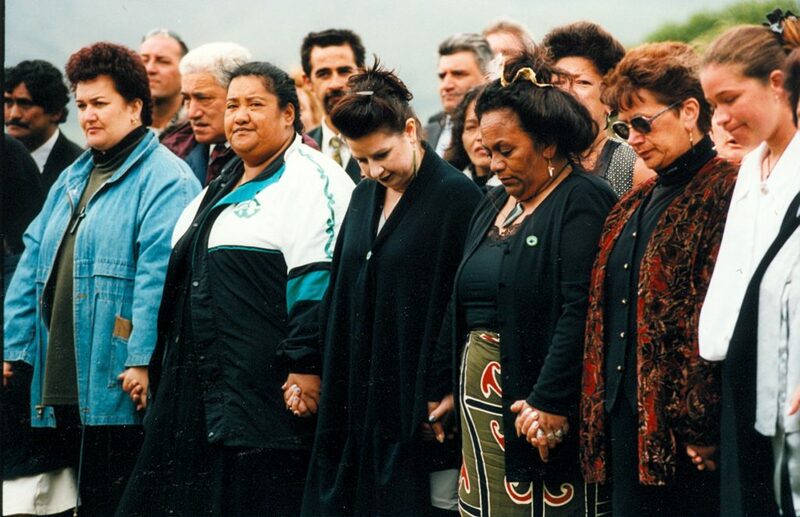 Although some Ngāi Tahu were in favour of selling land to Mackay at that time, they were also anxious to protect their rights to their traditional sources of Pounamu and so the Crown offer was rejected. 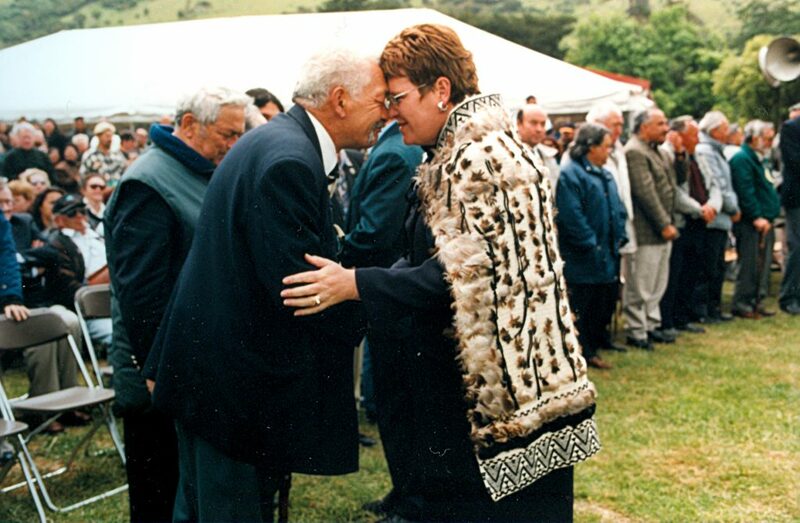 Mackay returned in 1860 with authority to offer up to £400 and to set aside up to 10,000 acres of land for Ngāi Tahu. After some discussion, Ngāi Tahu agreed to sell the land for £300 on the condition that they were able to retain ownership of the Arahura River from its source to the sea, as well as a number of other reserves including the Māwhera Reserve (now the site of the town of Greymouth). The total area of reserves set aside for Ngāi Tahu under this purchase was a mere 6,724 acres. In the Arahura Valley, Mackay awarded only 2,000 acres, around 14,000 acres less than the area required to meet the Ngāi Tahu request. Perhaps the greatest injustice associated with the Arahura Purchase occurred in the years immediately after the purchase. Mackay had been reluctant to allow Ngāi Tahu to keep the land contained in the Māwhera Reserve, as he was well aware that this land had a great deal of development potential. Mackay was to be proved correct and in the years following the purchase, the gold rushes of the 1860s brought many settlers to the West Coast. At first the Māori owners were able to lease the land to settlers and enjoy the benefits of the steady income from these leases. 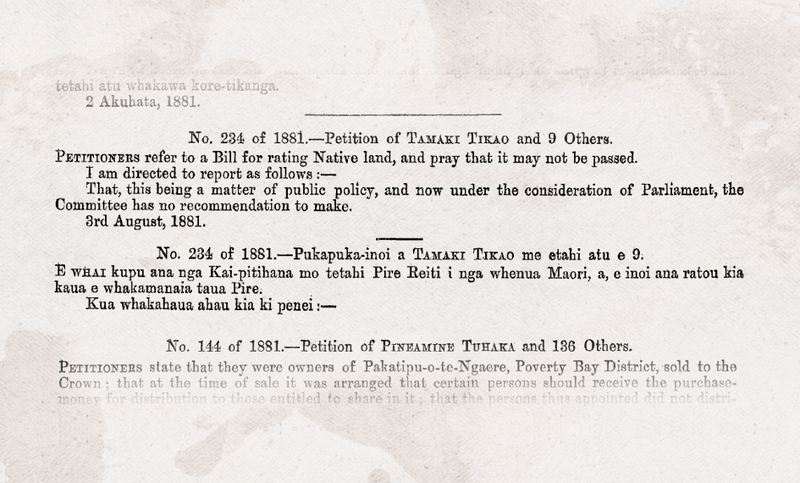 However, by 1887, the government of the day had removed the entire reserve from the control and effective ownership of Ngāi Tahu by granting perpetual leases over the reserve at a peppercorn rental. 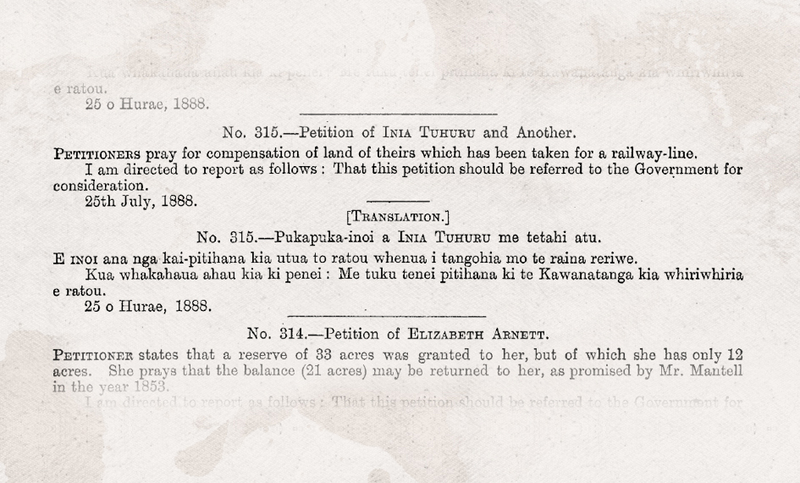 Rakiura (Stewart Island) was the last of the major land purchases in Te Waipounamu. The price paid was £6,000 for 420,000 acres, which was certainly the most generous of the Crown transactions. Nine reserves totalling 935 acres were set aside on the island. In addition, the Crown agreed to protect and preserve the rights of Rakiura Māori to access the nearby islands used for the harvesting of tītī. 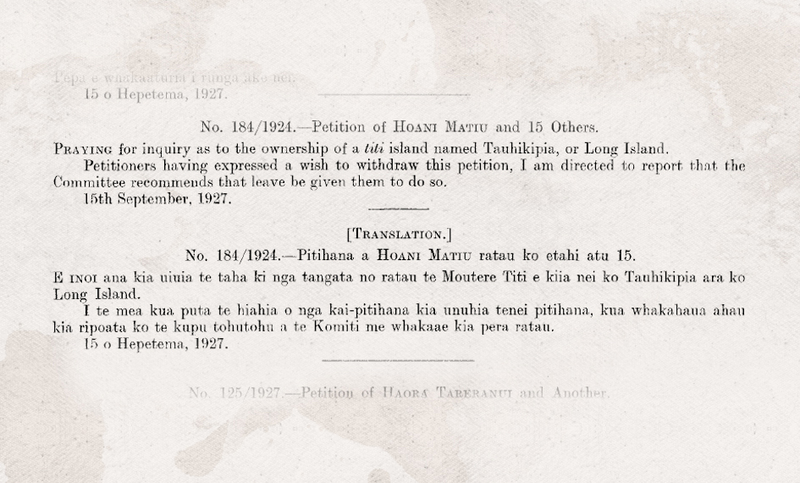 The Ngāi Tahu Claim to mahinga kai applies to all of the purchase deeds, although it is only specifically referred to in Kemp’s Deed. The Waitangi Tribunal found that the Crown’s duty to set aside sufficient land for the present and future needs of Ngāi Tahu included a duty to protect Ngāi Tahu access to mahinga kai. The definition of mahinga kai includes food and other natural resources and the places from where these things are gathered. Not only did Ngāi Tahu lose ownership and control over these important places, but the activities associated with settlement of the land and the development of pastoral farming resulted in the wholesale destruction of the natural habitat which sustained these resources. Mahinga kai was, and still is, a fundamental part of tribal life, and consequently was a very significant part of the Ngāi Tahu Claim. 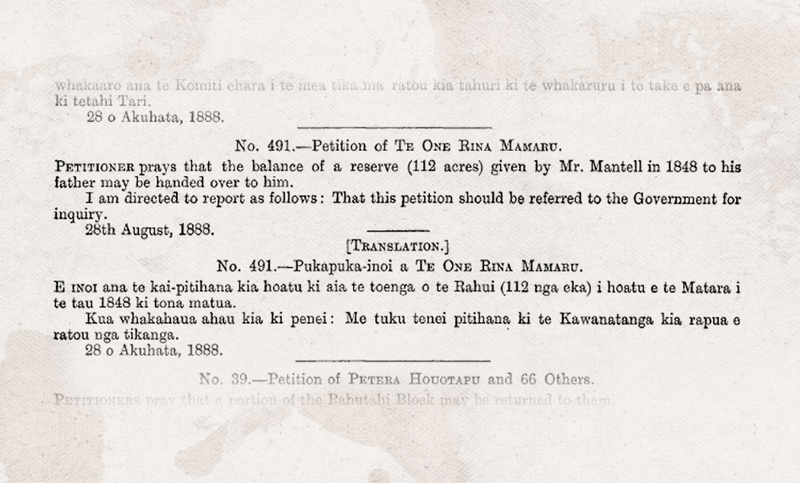 Between 1844 and 1864, Ngāi Tahu signed land sale contracts with the Crown for some 34.5 million acres, which amounts to approximately 80 per cent of Te Waipounamu. The iwi believed that one-tenth of each purchase would be reserved for the Ngāi Tahu vendors, thereby guaranteeing a stake in the increasing capitalisation of the country. However, the Crown did not allocate one-tenth of the land to Ngāi Tahu, nor did they pay a fair price. They also failed to honour promises to ensure the iwi still had access to mahinga kai, and to build schools and hospitals. 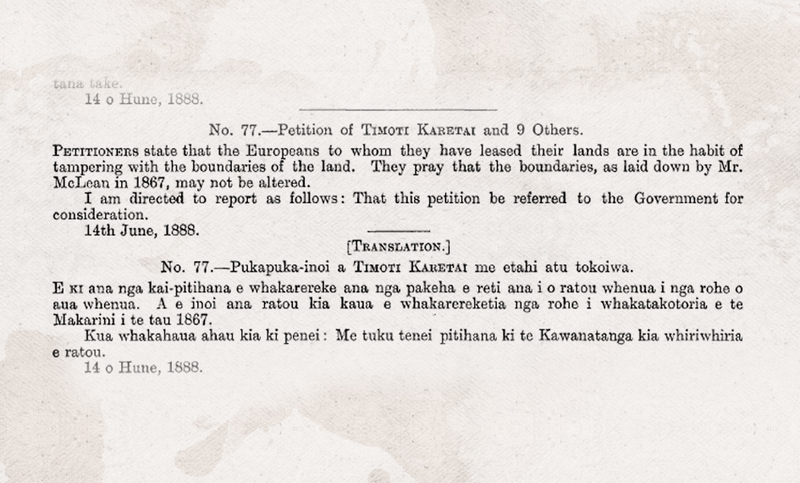 In 1849 the Ngāi Tahu rangatira Matiaha Tiramorehu made the first formal statement of Ngāi Tahu grievances about the land purchases. 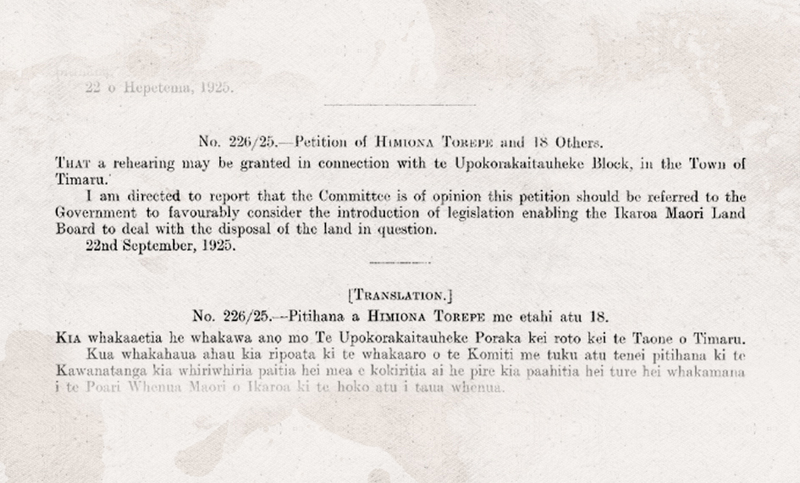 His letter to Lieutenant Governor Edward Eyre urged the Crown to set aside adequate reserves of land for the iwi as agreed to under the terms of its land purchases. 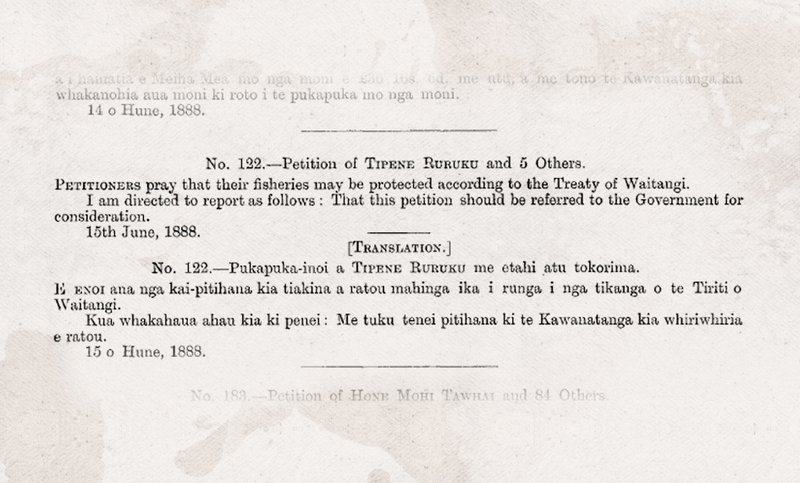 In 1857 Tiramorehu, with the support of all of the leading Ngāi Tahu rangatira at the time, sent a second letter to Queen Victoria. 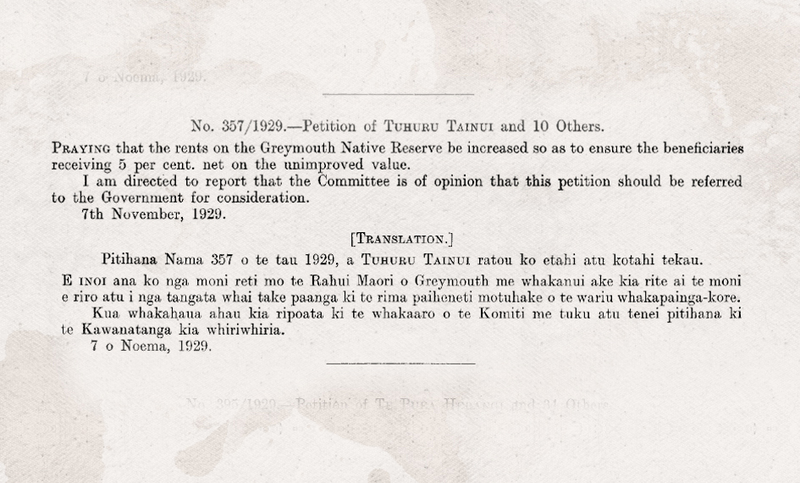 Below are just a few of the many Ngāi Tahu petitions sent to the Crown in regard to the Ngāi Tahu land purchases. These have been gathered from the digital collection of the Appendices of Journals of the House of Representatives. 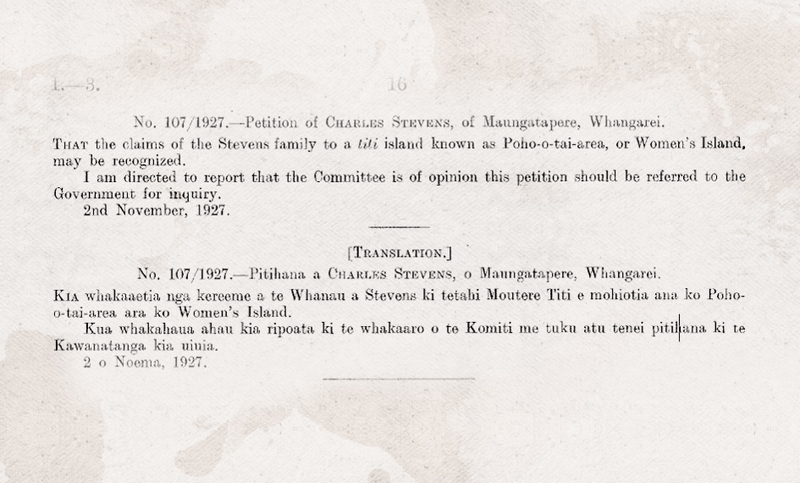 These Appendices hold an extensive record of the petitions pertaining to Māori grievances. 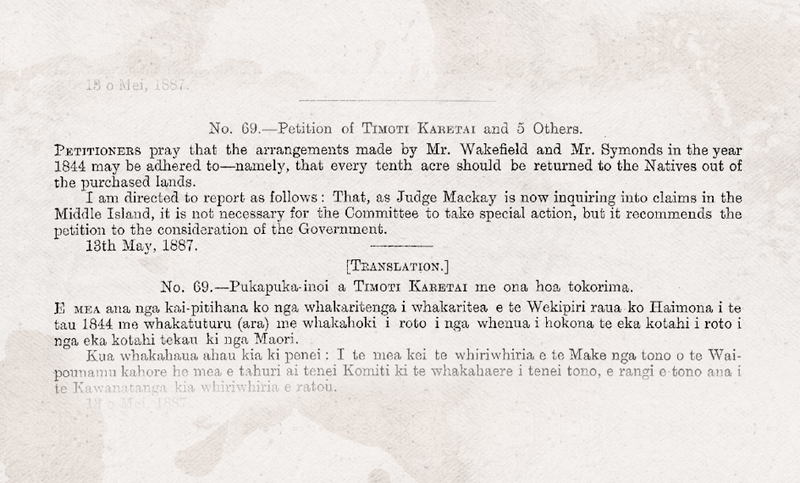 Ngāi Tahu first took its case to the Māori Land Court before Chief Judge Francis Dart Fenton in 1868, receiving only paltry additional rights. 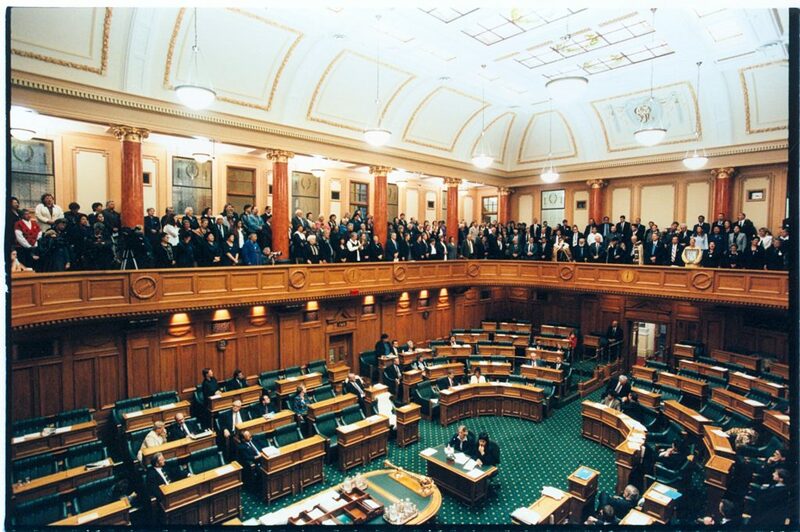 It then attempted to challenge the judgment in the Supreme Court, but the Government acted to remove it from the Court’s jurisdiction with the Ngaitahu Tahu Reference Validation Act later that year. A Royal Commission of Inquiry was established to investigate grievances associated with Kemp’s, Akaroa, Otago, and Murihiku Purchases. Thomas Smith of the Native Land Court and Francis Nairn were appointed by Governor George Grey to carry out the examination — hence the Smith-Nairn Commission. Over two years a vast amount of evidence was collected, returning interim findings in support of Ngāi Tahu. However, following a change in government, the Commission had its funding halted and went into recess without delivering a final report. 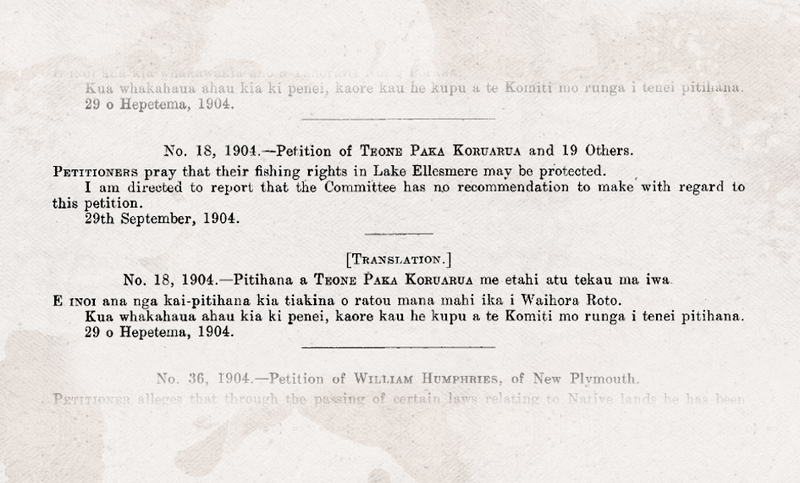 Ngāi Tahu continued to voice its grievances, and in 1886 another Royal Commission was undertaken. 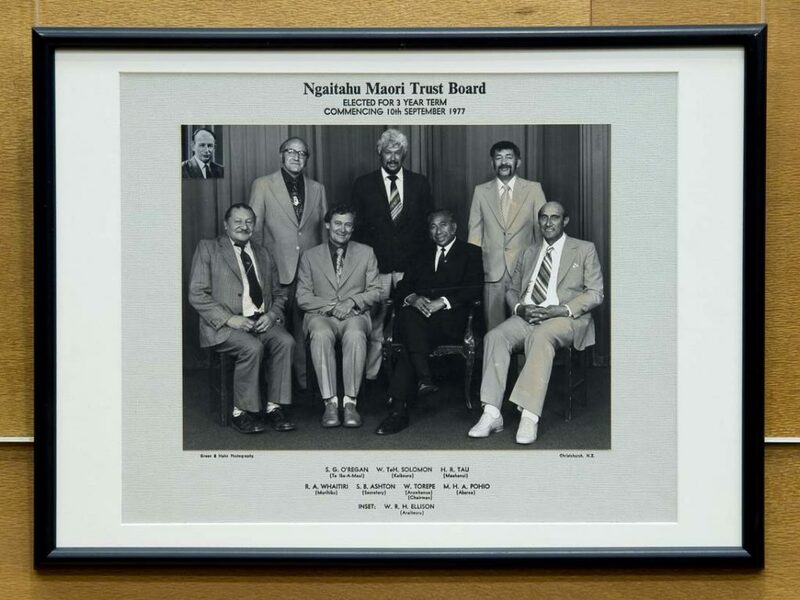 Led by Judge Alexander Mackay, this Commission stated plainly that the tribe needed land, and recommended over 200,000 acres in compensation. However, another change of government meant the Commission’s report was never actioned. This was followed by a second Mackay inquiry, but despite providing a compelling description of the tribe’s poverty, there was still no outcome. 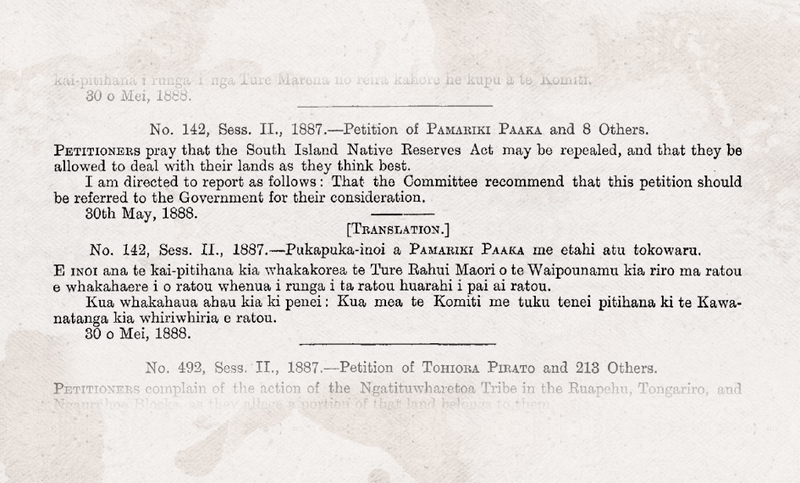 In 1906 the South Island Landless Natives Act allocated some 116,000 acres of remote bush and forest land to Ngāi Tahu. This land included some of the most desolate bush country of western Southland and Rakiura (Stewart Island). 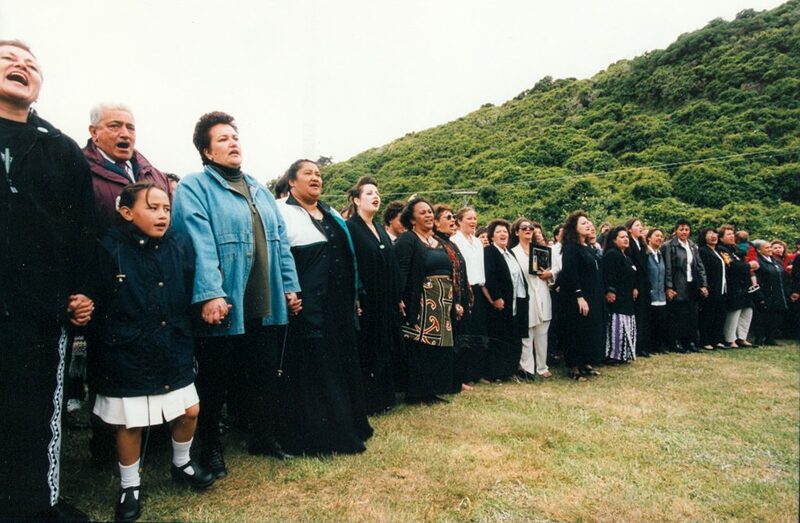 This amounted to an average of 31 acres for each of the listed Ngāi Tahu iwi members. However, it was still a stark contrast to landless Europeans of the same era, who were being awarded parcels of productive farmland approximately five times that size. 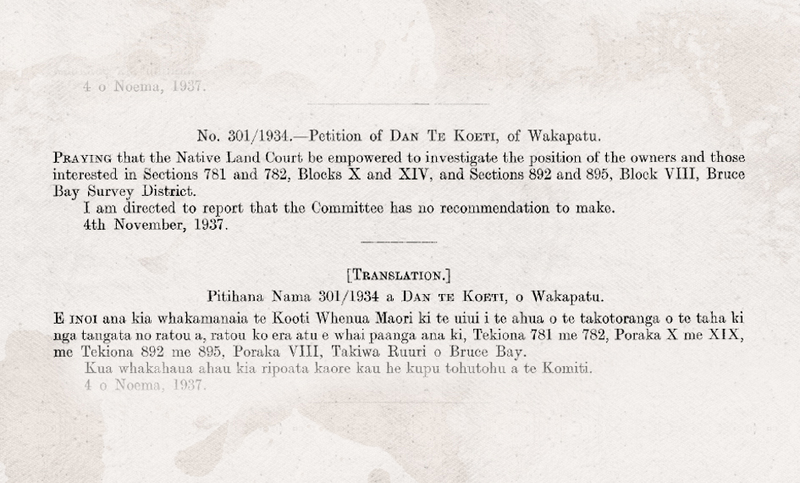 In 1921, yet another Royal Commission investigated the Ngāi Tahu grievances associated with Kemp’s Deed. 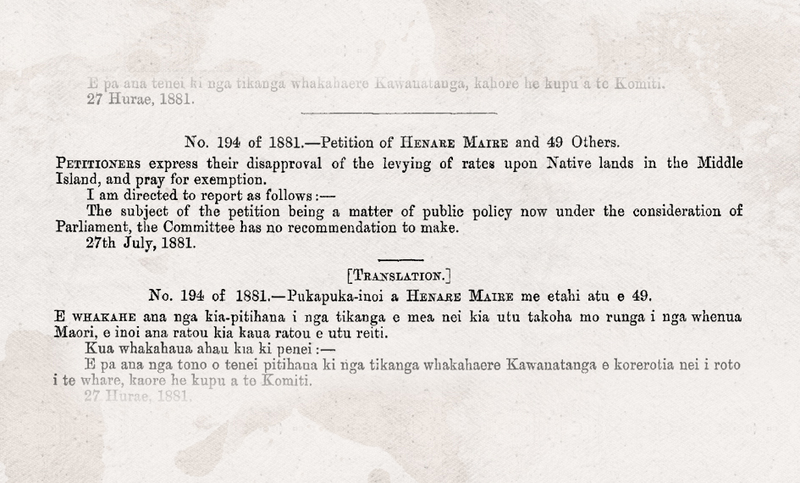 Led by the Native Land Court’s chief judge, Robert Jones, thus also known as the ‘Jones Committee’, the Commission ruled in favour of Ngāi Tahu outlining the inadequacy reserves set aside in Kemp’s Deed, and the ineffectiveness of the 1868 ‘Fenton Reserves’ and 1906 ‘SILNA Reserves’. As no land was available, the Commission recommended monetary compensation of £354,000. 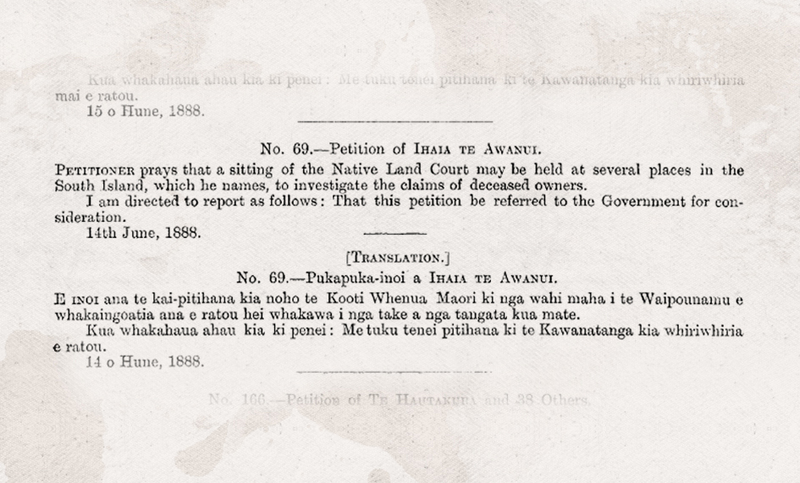 Under the Native Land Amendment and Native Land Claims Adjustment Act of 1923, the Native Land Court was empowered to ascertain and determine who the Ngāi Tahu persons are entitled to participate in any relief that may be granted in respect of Kemp's Deed. 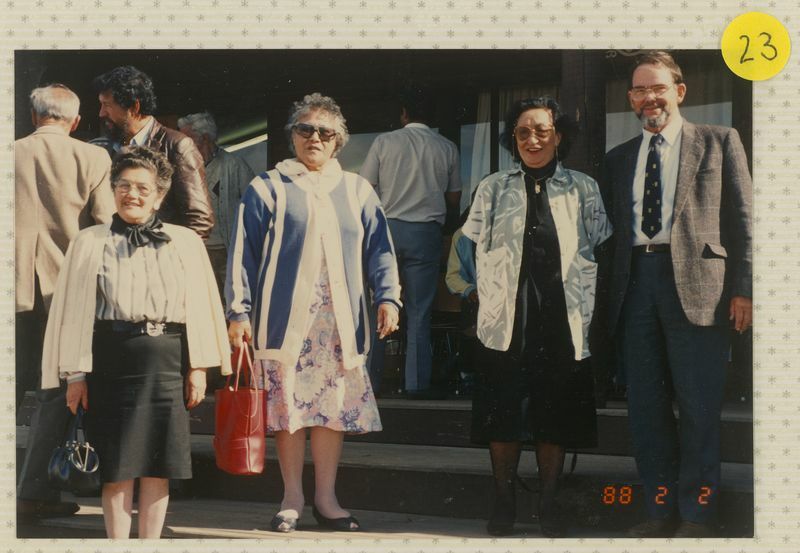 In 1925 the Native Land Court established the Ngaitahu Census Committee to work with the Court to identify Ngāi Tahu beneficiaries. 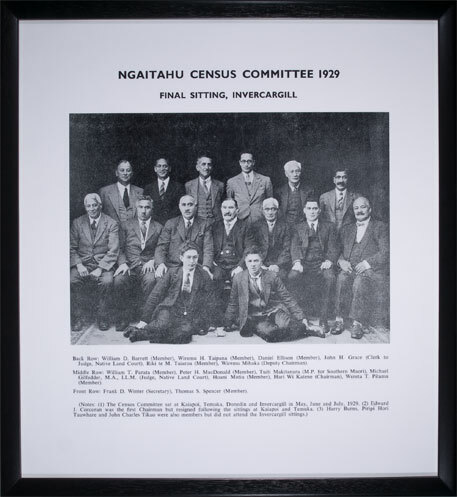 The Native Land Court established a second Ngaitahu Census Committee in 1929 to review the 1925 Ngāi Tahu beneficiary list. The committee sat at Kaiapoi, Temuka, Dunedin, and Invercargill in May, June, and July of 1929. 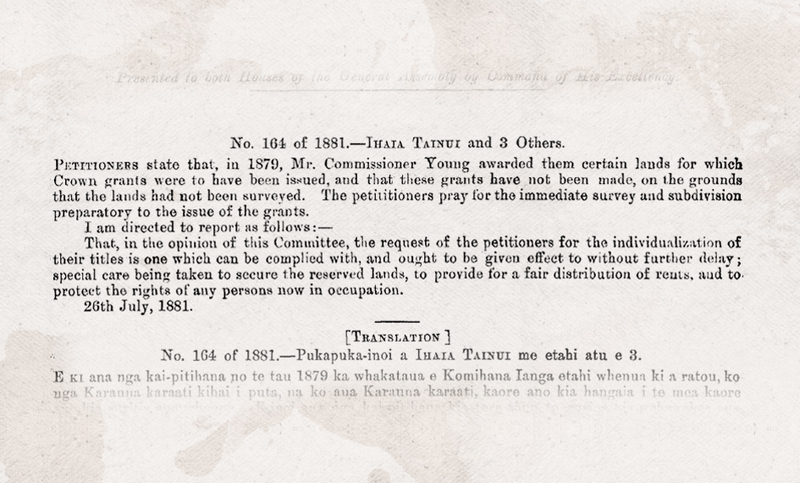 The Census Committee recommended to the Native Land Court that the original 1925 Ngāi Tahu beneficiary list be amended to include more kaumātua of 1848. 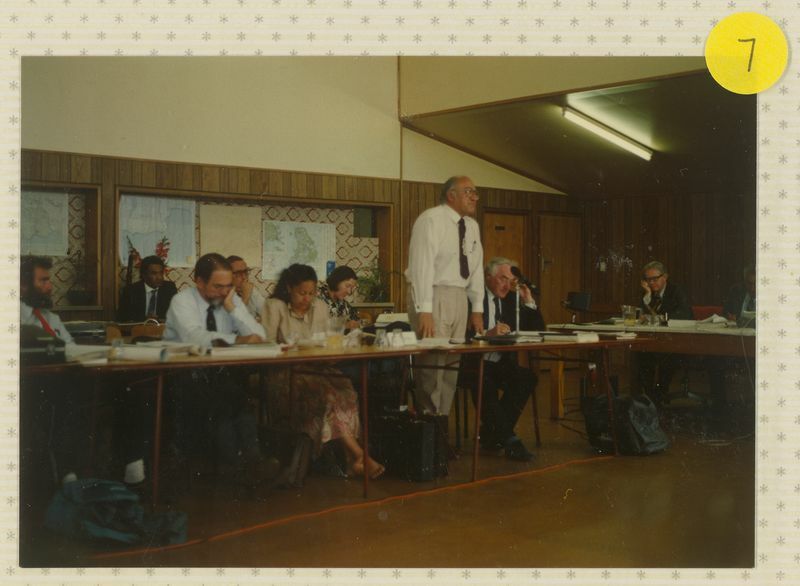 In 1966 the Ngaitahu Maori Trust Board petitioned the Maori Affairs Committee for the work of the 1929 Ngaitahu Census Committee to be legally recognised. 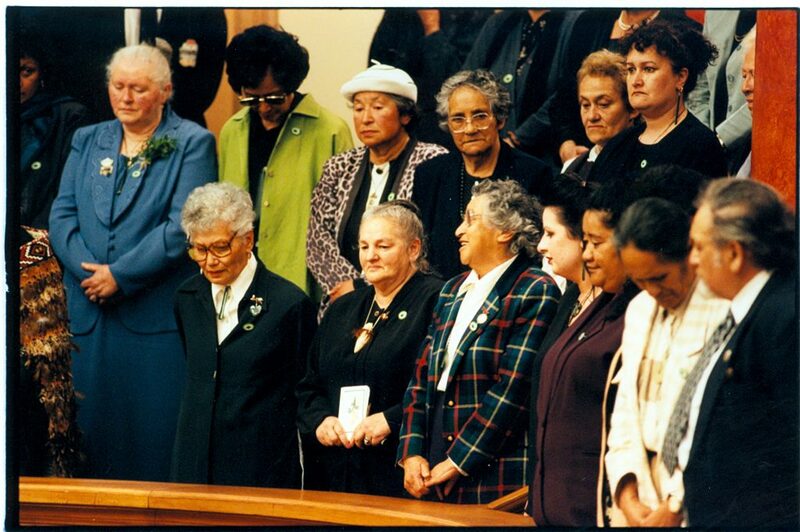 This was achieved through the enactment of the 1966 Maori Purposes Act. 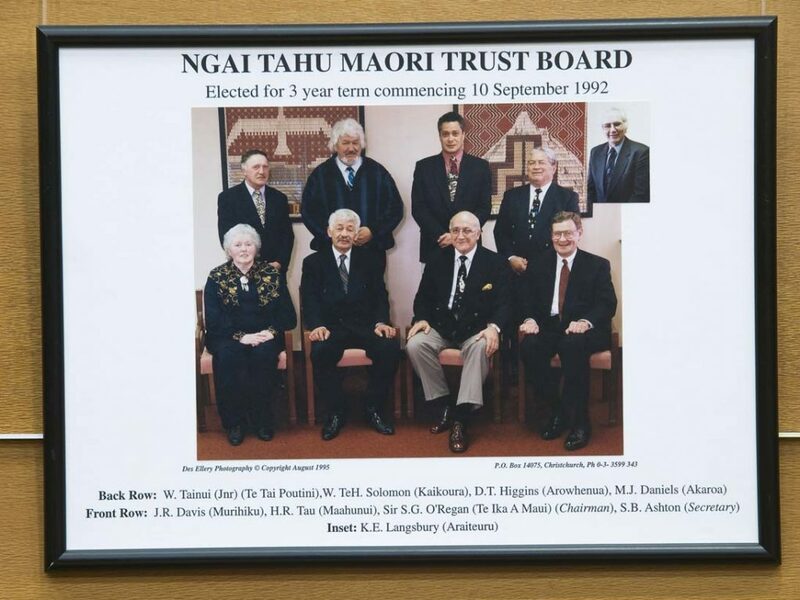 In the following year the Trust Board published this modified list as “Ngāi Tahu Kaumatua Alive in 1848 as established by the Maori Land Court in 1925, and the Ngaitahu Census Committee in 1929”. This list is commonly known as “the Blue Book”, and is still used to determine eligibility to register with Ngāi Tahu today. 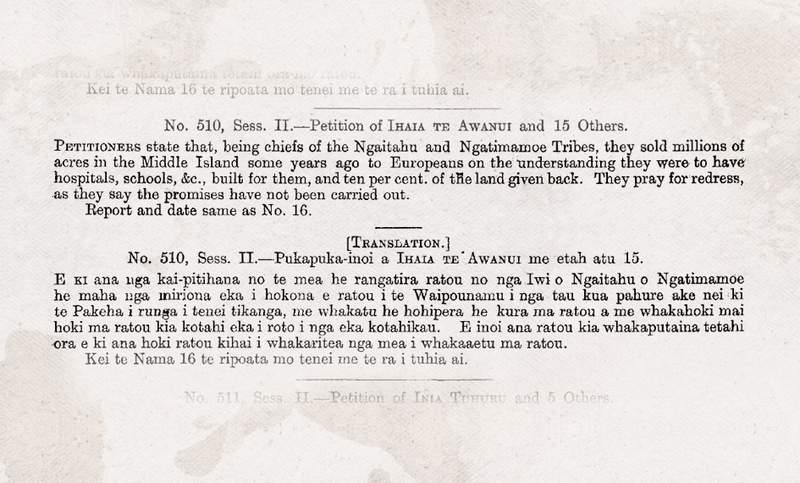 In 1944, recognising an obligation to its Māori constituents for Māori sacrifices in the Second World War, the Ngaitahu Claim Settlement Act was passed to provide Ngāi Tahu with some relief. The Act authorised annual payments of £10,000 a year for 30 years ceasing in 1973; the figure based on the recommendation from the 1921 Native Land Claims Commission. This “settlement” was arranged by the Government without “real and substantial agreement by Ngāi Tahu beneficiaries”. It was grudgingly accepted on the basis that “half a loaf is better than none”. 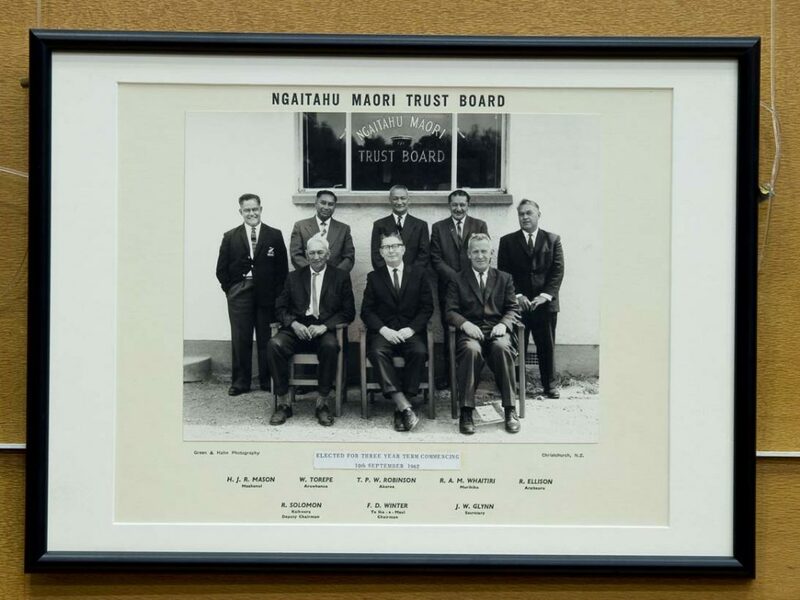 The first Ngaitahu Trust Board was initially established in 1928 under the new Native Land Amendment and Native Land Claims Adjustment Act. 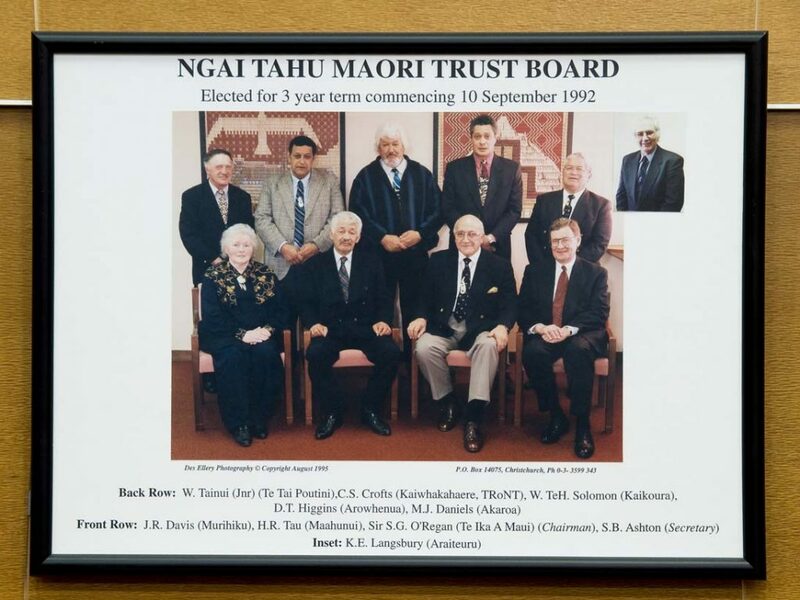 The Board was designed to represent Ngāi Tahu beneficiaries for the purpose of discussing and arranging terms of any future settlement. 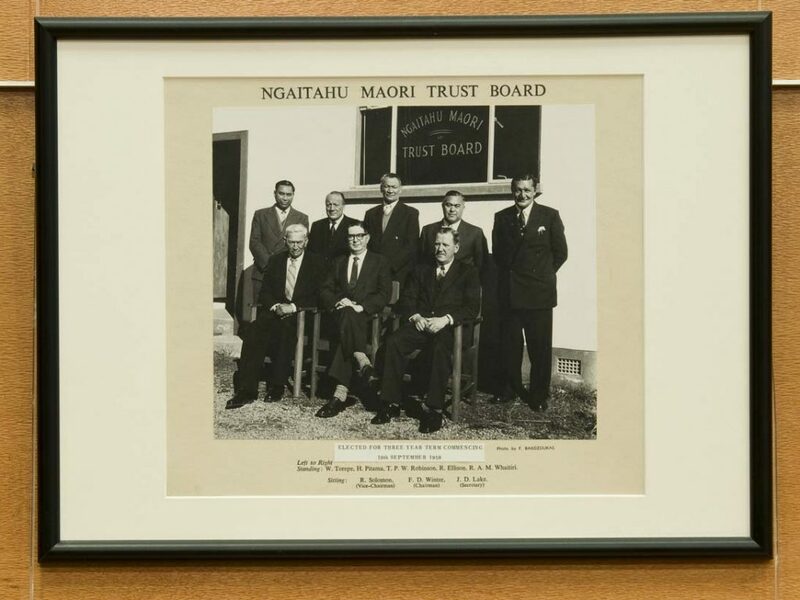 The Trust Board fell away during the 1930s, and was then reconstituted under the Ngaitahu Trust Board Act of 1946 to administer the £300,000 monetary compensation from the 1944 Settlement Act for the general benefit of Ngāi Tahu beneficiaries. 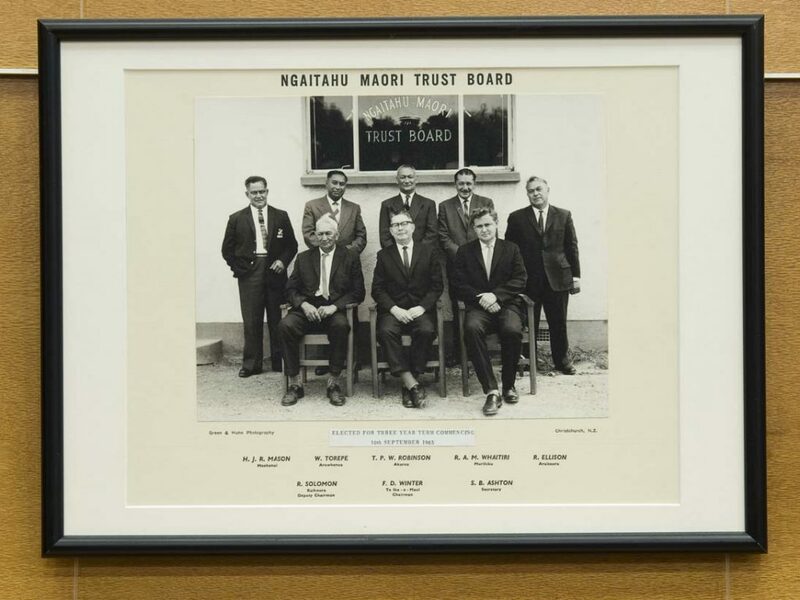 The Maori Trust Boards Act of 1955 changed the designation of the Ngaitahu Trust Board to the Ngaitahu Maori Trust Board. 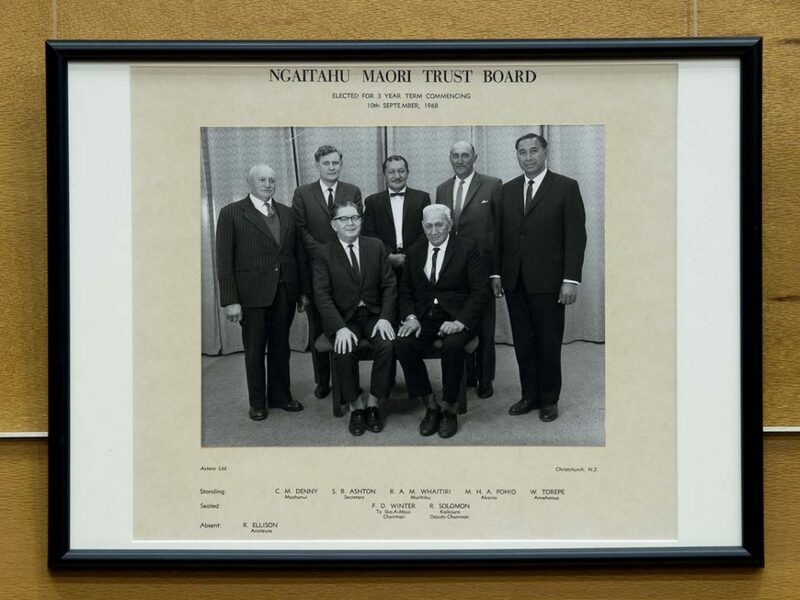 In 1975 the Waitangi Tribunal was established to investigate breaches made by the Crown in relation to the Treaty of Waitangi that occurred since the Tribunal’s establishment. It wasn’t until 1985 that the Tribunal’s jurisdiction was extended to hear claims about any alleged breach of the Treaty since 1840. 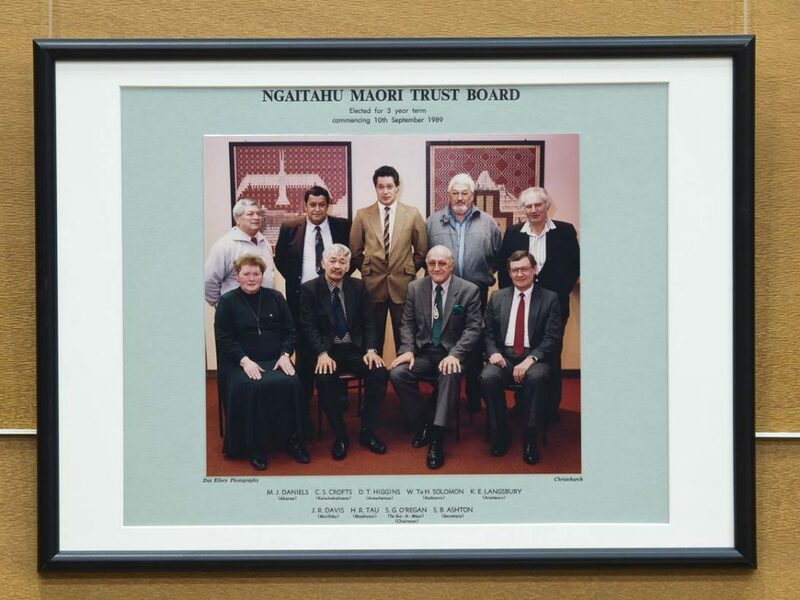 In 1986, Henare Rakiihia Tau, on behalf of the Ngaitahu Maori Trust Board, submitted the Ngāi Tahu Claim to the Waitangi Tribunal. 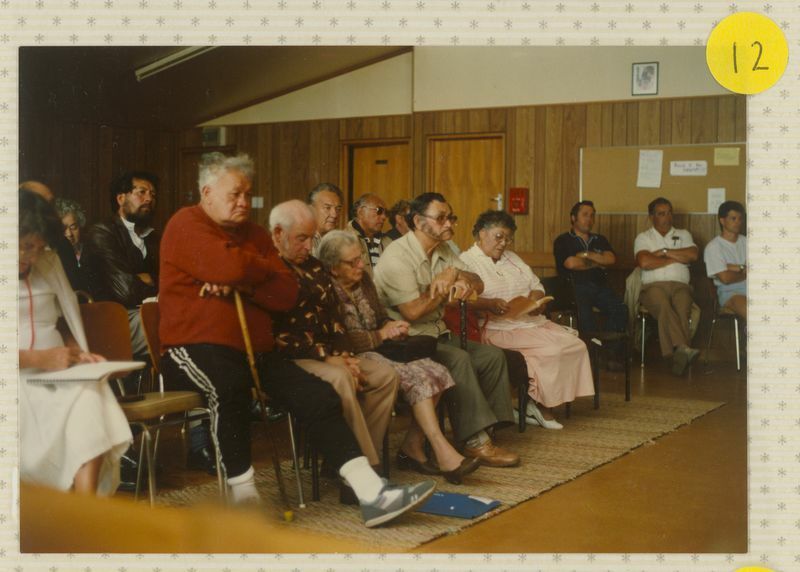 From 1987 to 1989 the Waitangi Tribunal travelled around Te Waipounamu, hearing and considering evidence at a number of marae. The Ngāi Tahu Claim was to be the largest claim heard by the Tribunal. 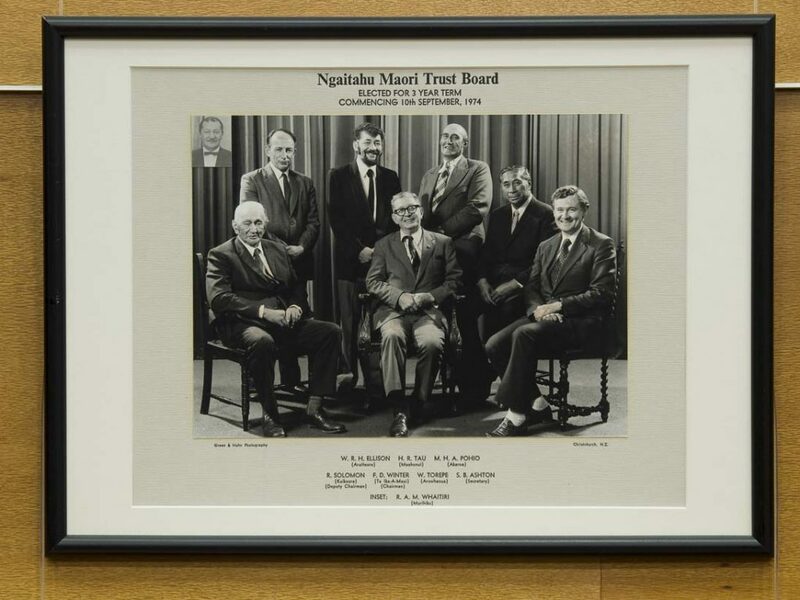 Over the following three years the Trust Board undertook a powerhouse of work with historians and Ngāi Tahu whānui, collating a wealth of information on Ngāi Tahu lands, histories, and traditions. The evidence was presented as “the Nine Tall Trees”; the eight major land purchases representing the first eight trees, and the ninth represented by mahinga kai. 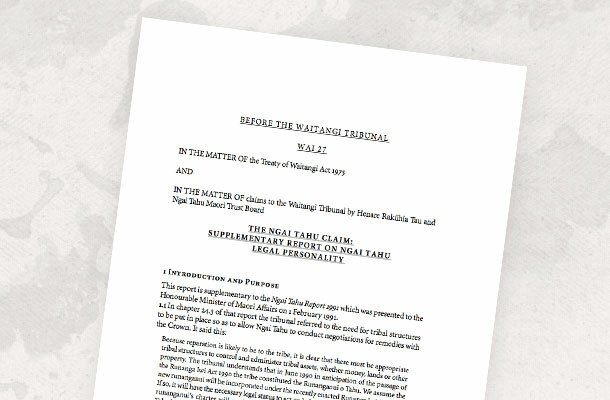 Following the hearings, the Waitangi Tribunal produced four separate reports regarding the Ngāi Tahu Claim. 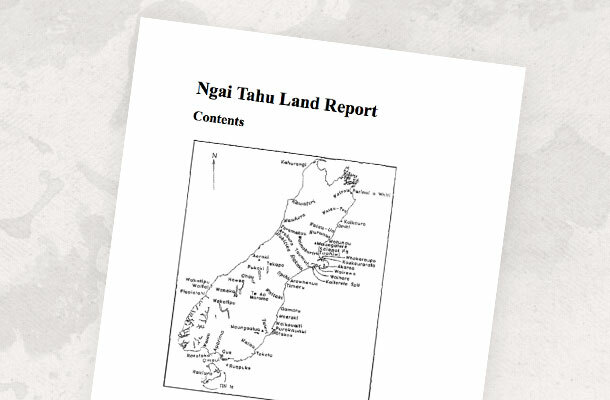 The “Ngāi Tahu Land Report” was first released in 1991 and covered the Nine Tall Trees. 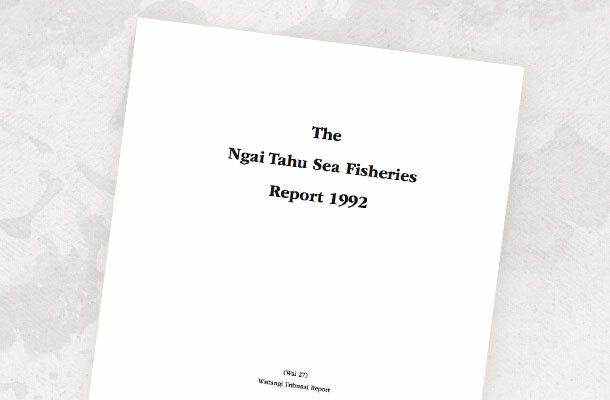 The second and third reports were released in 1992, addressed Ngāi Tahu legal personality and sea fisheries claims. 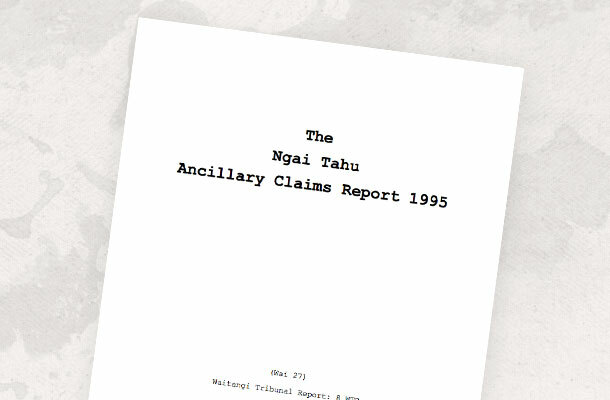 The final report in 1995 covered the ancillary claims — private individual claims heard by the Tribunal, but completely separate from the collective Ngāi Tahu Claim. 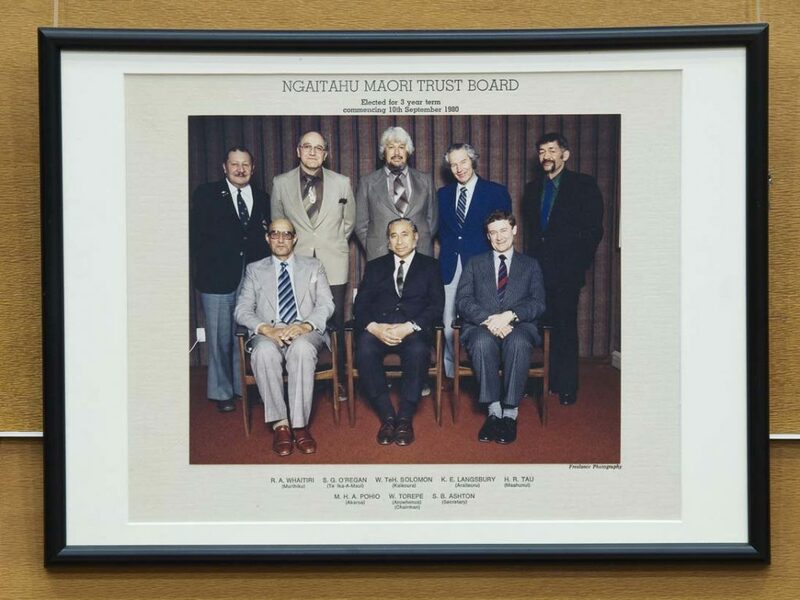 In the early 1980s the Ngaitahu Maori Trust Board began grappling with the issue of developing a governance structure with its own legal personality that was accountable to Ngāi Tahu people and rūnanga, rather than the Crown. 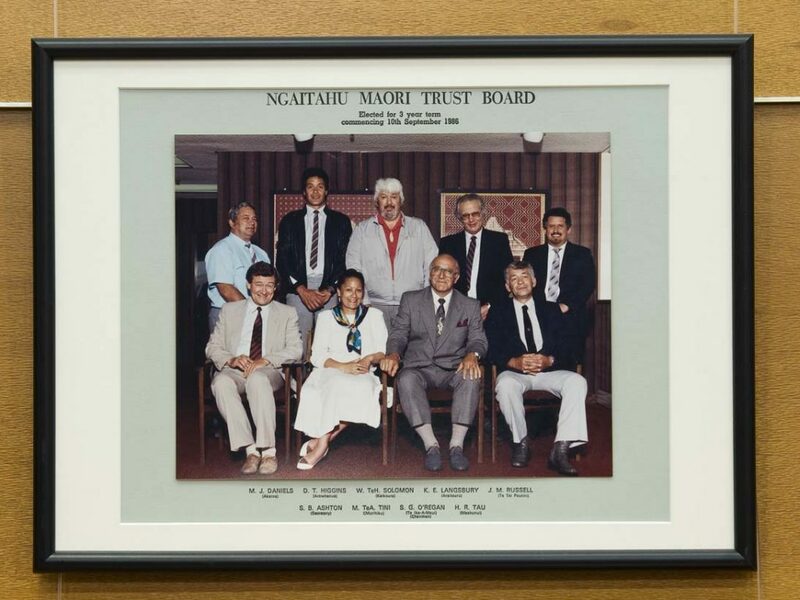 The Trust Board first created Te Rūnangaui o Tahu in 1990 under the Incorporated Societies Act. 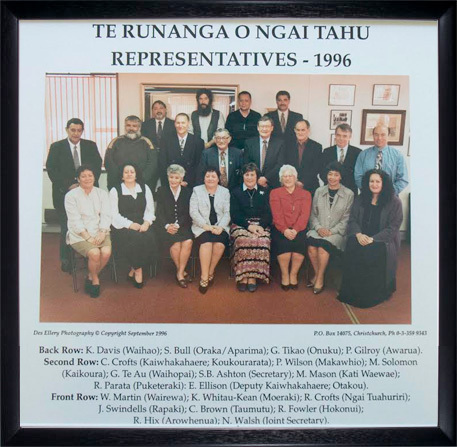 When the Rūnanga Iwi Act was repealed soon after its enactment in 1990, the Trust Board recommended to the Waitangi Tribunal that legislation be introduced to constitute a Ngāi Tahu Iwi Authority. 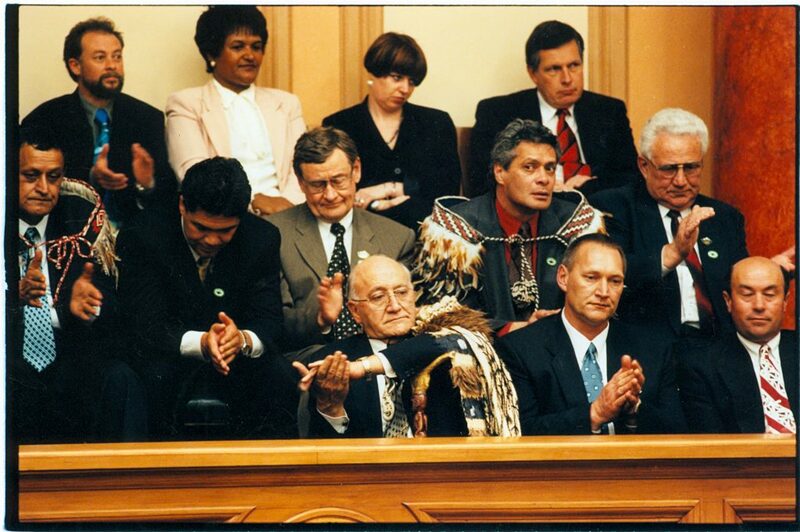 The Tribunal accepted this recommendation, and the subsequent enactment of the Te Rūnanga o Ngāi Tahu Act in 1996 created Te Rūnanga o Ngāi Tahu to provide Ngāi Tahu with its own legal identity and lawful independence to complete negotiations with the Crown. 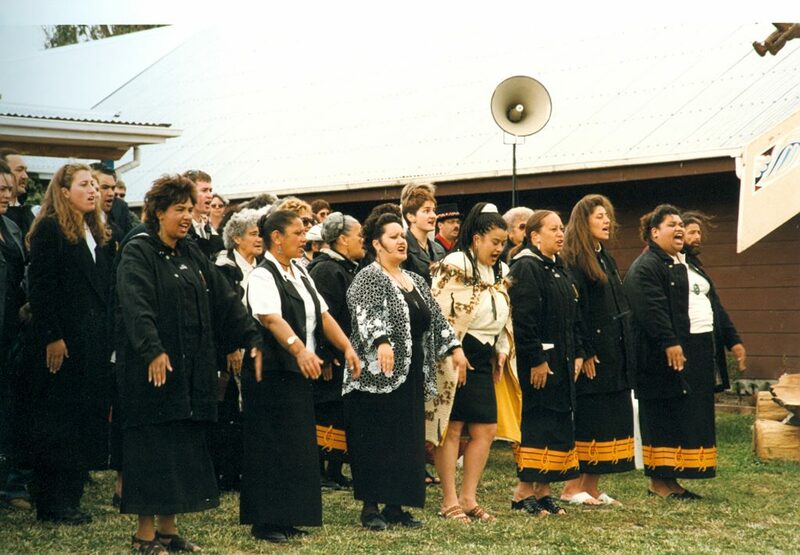 Settlement negotiations between Ngāi Tahu and the Crown began in 1991, following the release of the Waitangi Tribunal’s “Ngāi Tahu Land Report”. 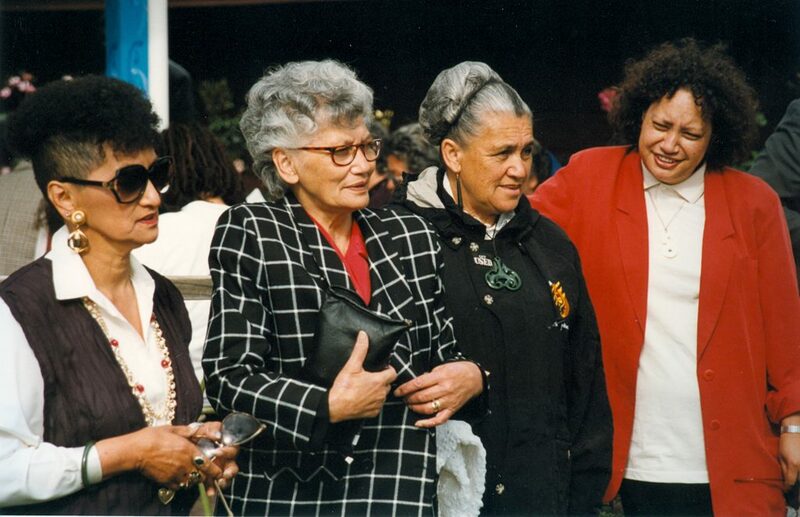 From 1991 to 1994, the Crown and Ngāi Tahu held monthly negotiation meetings until negotiations broke down in mid-1994. 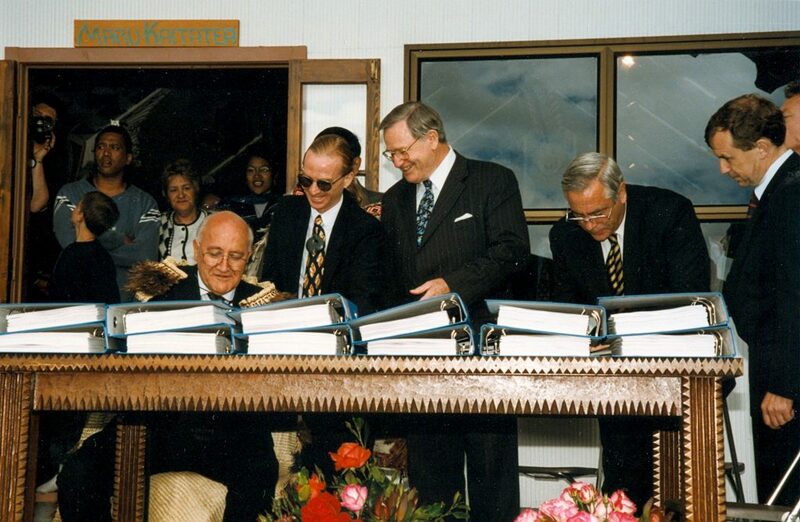 Negotiations weren’t resumed until 1996 following an intervention from Prime Minister Jim Bolger which culminated with the passing of the Ngāi Tahu Claims Settlement Act in 1998. 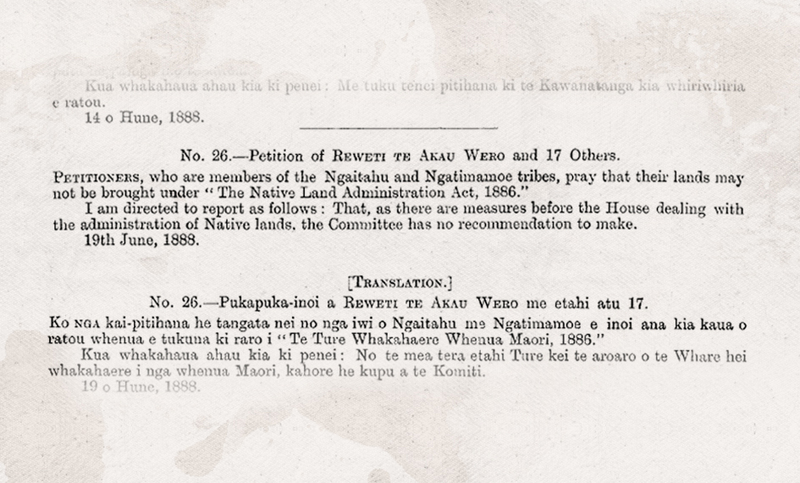 The Ngāi Tahu Settlement was negotiated on behalf of Ngāi Tahu by the Ngāi Tahu Negotiating Group. The team was further refined into three task groups. 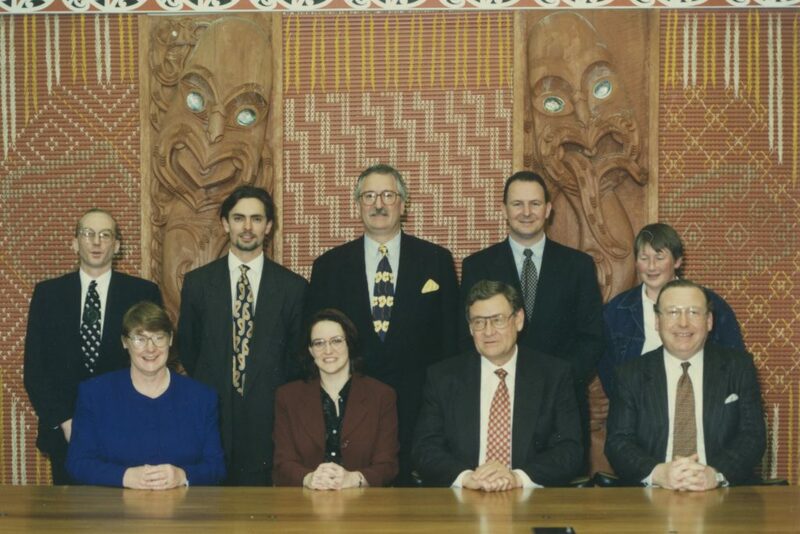 Chaired by Tā Tipene O’Regan, the “Ngāi Tahu A-Team” was mandated to manage the negotiations process, and negotiated directly with government ministers, resolving any major differences. The “B-Team” worked directly with the A-Team, advising on all matters relating to the Claim. It dealt with high-level officials from many government departments. The C-Team was a diverse specialist group that carried out the detailed research. 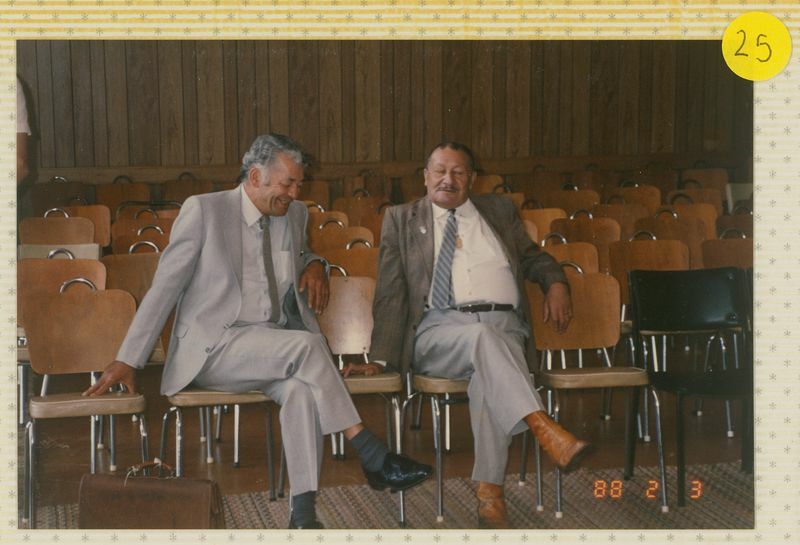 The B and C Teams interacted with the officials and staff of various government departments, often at an operational level, and bore the brunt of the day-to-day negotiations with the Crown on every aspect of the Ngāi Tahu Settlement. 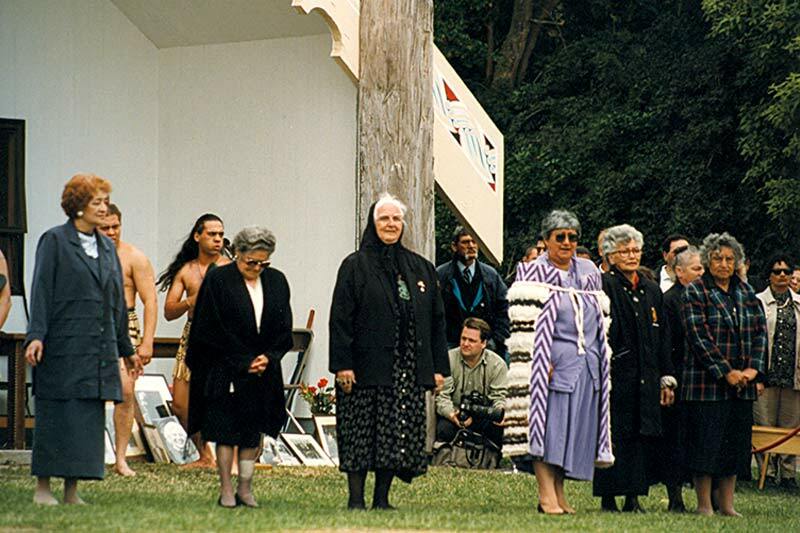 The Crown and Te Rūnanga o Ngāi Tahu entered into a Deed of “On Account” Settlement in 1996 as a sign of the Crown’s good faith and demonstration of goodwill. 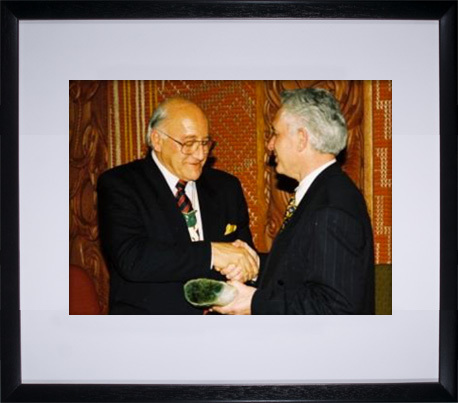 This agreement included the payment of $10 million, the vesting of pounamu within the Ngāi Tahu takiwā, and the vesting of Tūtae-patu Lagoon to Te Rūnanga o Ngāi Tahu. 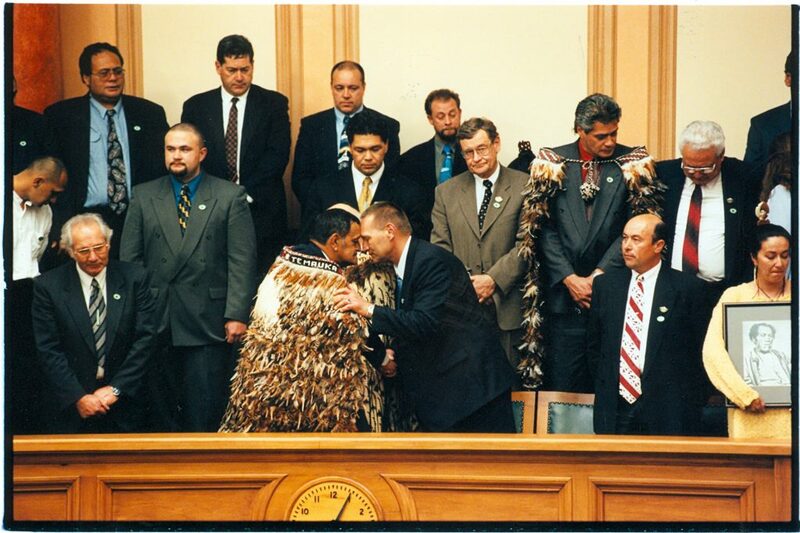 These last two promises were constituted through the enactment of the Ngāi Tahu (Pounamu Vesting Act) in 1997, and the Ngāi Tahu (Tūtaepatu Lagoon Vesting) Act in 1998. 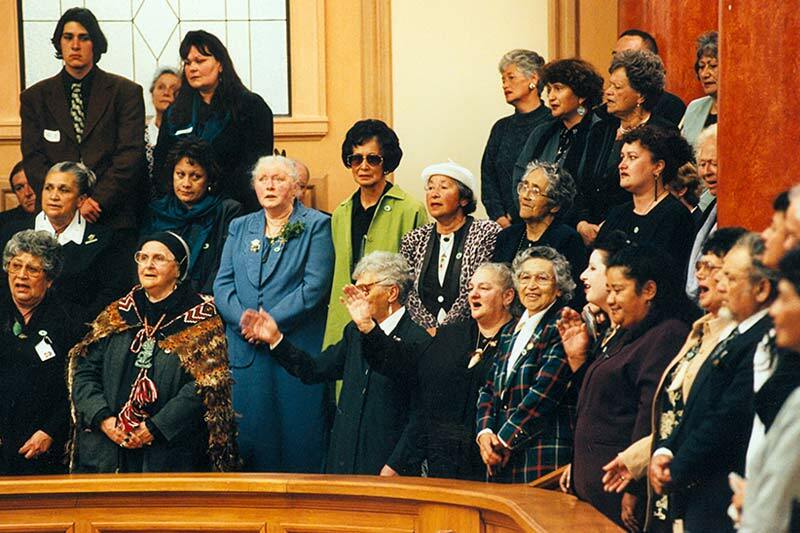 In 1997, the Crown and Te Rūnanga o Ngāi Tahu signed a non-binding Heads of Agreement to record on a without-prejudice basis the matters which they had agreed in principle should be contained in a Deed of Settlement to effect a settlement of the Ngāi Tahu claims. 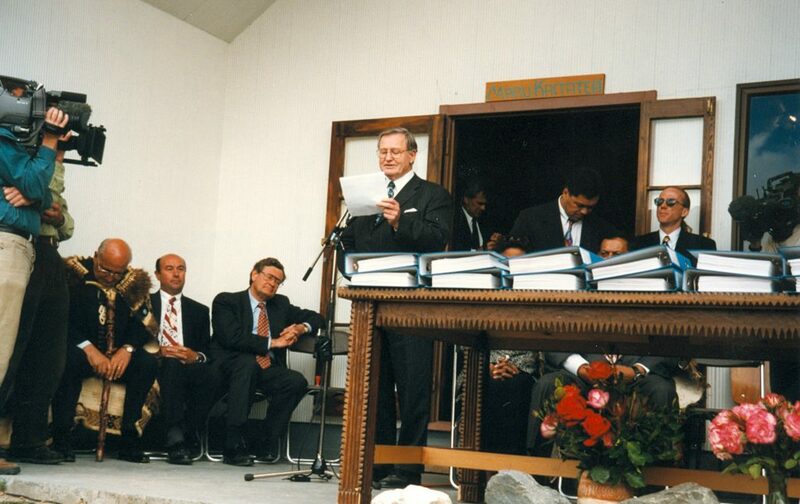 The Ngāi Tahu Deed of Settlement was signed at Takahanga Marae on Kaikōura in 1997. 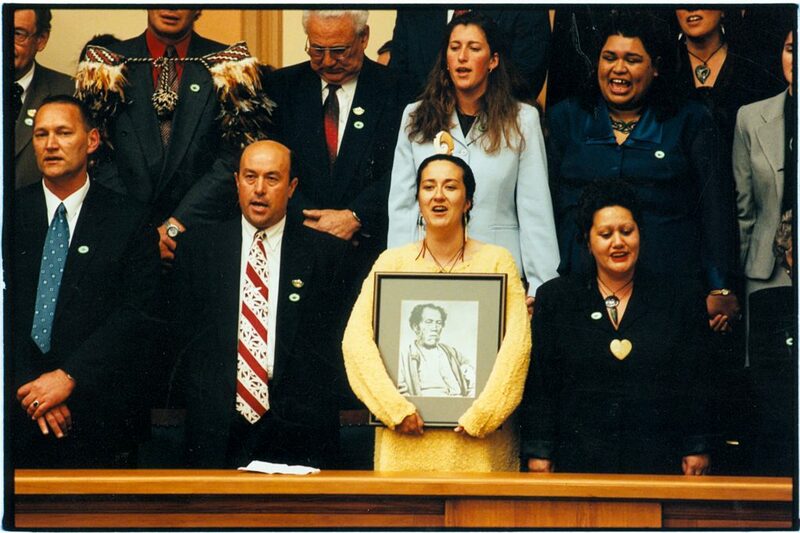 It was legislated the following year through the enactment of the Ngāi Tahu Claims Settlement Act. 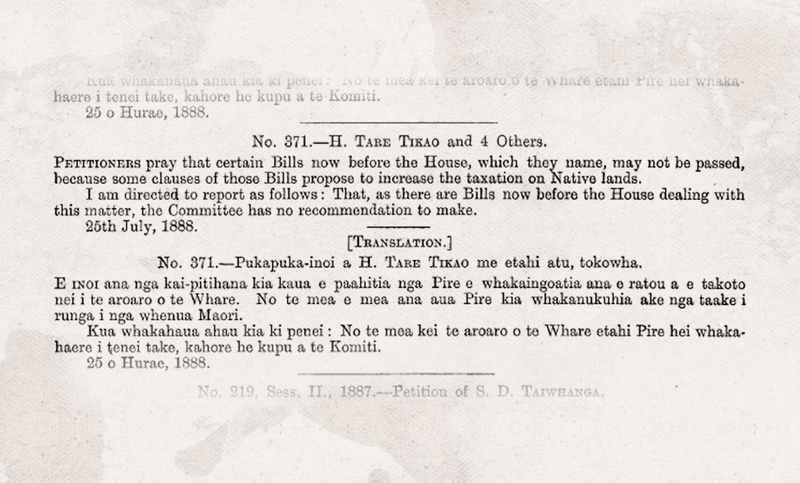 The Ngāi Tahu Claims Settlement Act provided five main areas of redress to Ngāi Tahu, including the return of Aoraki, which would then be immediately gifted back to the nation. 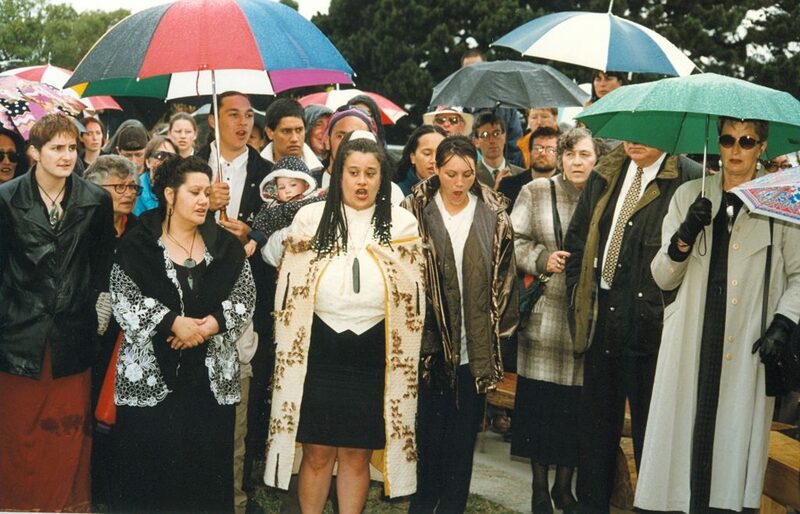 A formal apology followed from the Crown, in which the Crown expressed (its) profound regret and apologised unreservedly for the suffering and hardship caused to Ngāi Tahu. Economic Redress Mechanisms involved a cash compensation of $170 million, plus several new mechanisms to provide Ngāi Tahu with the capacity, right and opportunity to re-establish its tribal base. The Settlement Act also includes innovative statutory Cultural Redress Mechanisms to restore the ability of Ngāi Tahu to give practical effect to its kaitiaki responsibilities, plus ownership of specific wāhi taonga. Finally, the Act provides for non-tribal redress for many of the private individual claims that were also heard by the Waitangi Tribunal, but were completely separate from the collective Ngāi Tahu Claim. 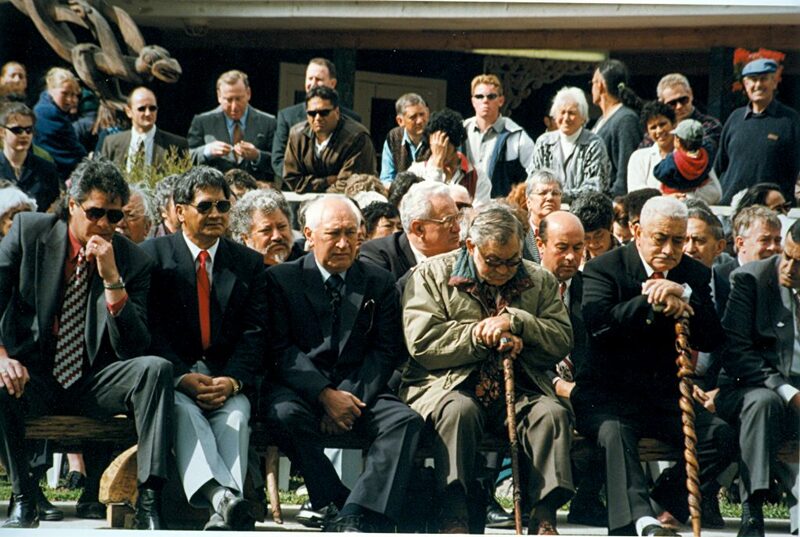 On 21 November 1997, Te Rūnanga o Ngāi Tahu and the Crown signed the Ngāi Tahu Deed of Settlement at Takahanga Marae. 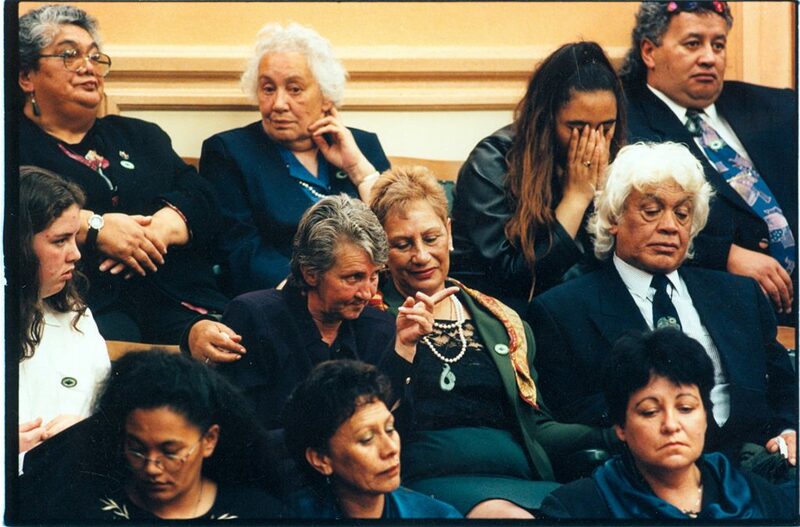 On 29 September 1998, Ngāi Tahu whānau travelled to Parliament for the third reading and passing of the Ngāi Tahu Claims Settlement Bill. 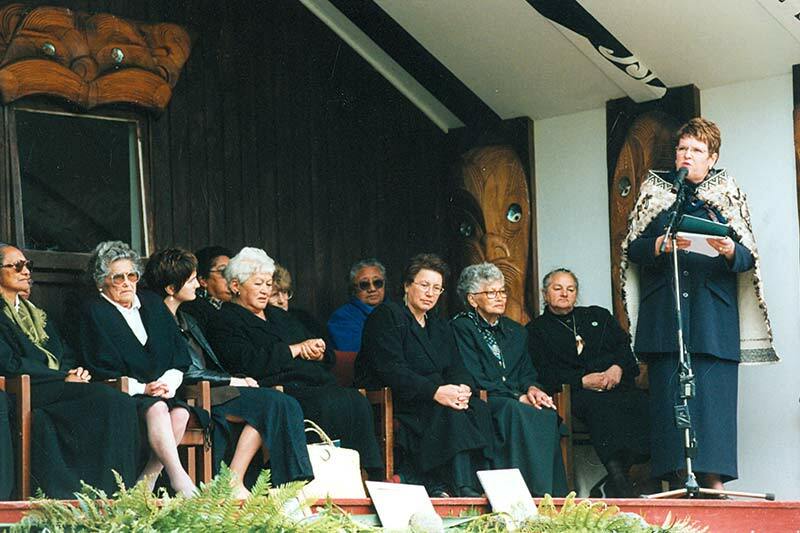 On 29 November 1998 Prime Minister Jenny Shipley delivered an Apology on behalf of the Crown to Ngāi Tahu whānui at Ōnuku Marae.